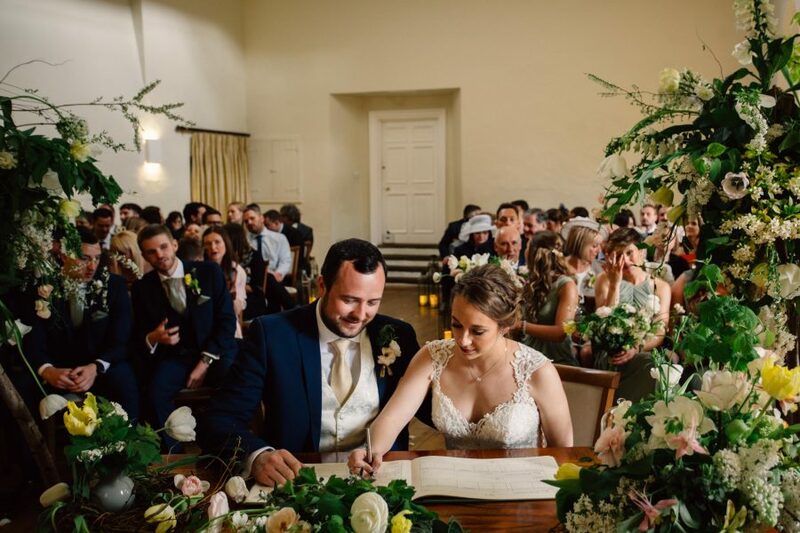 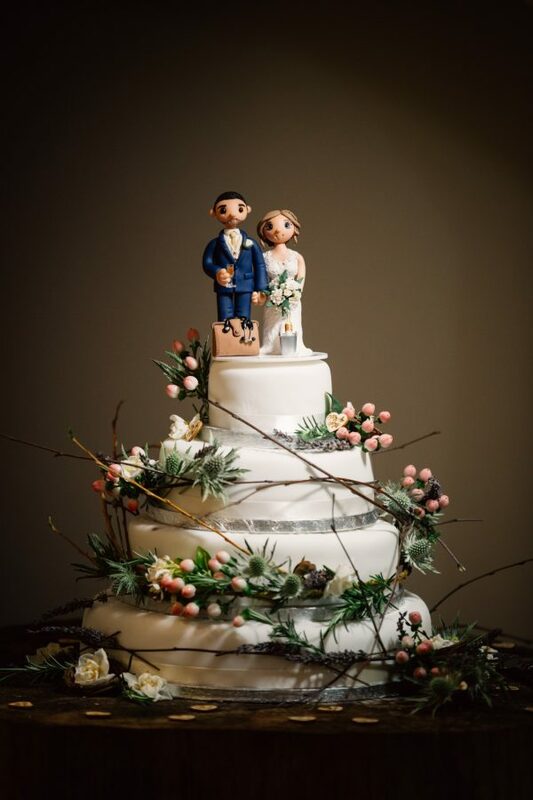 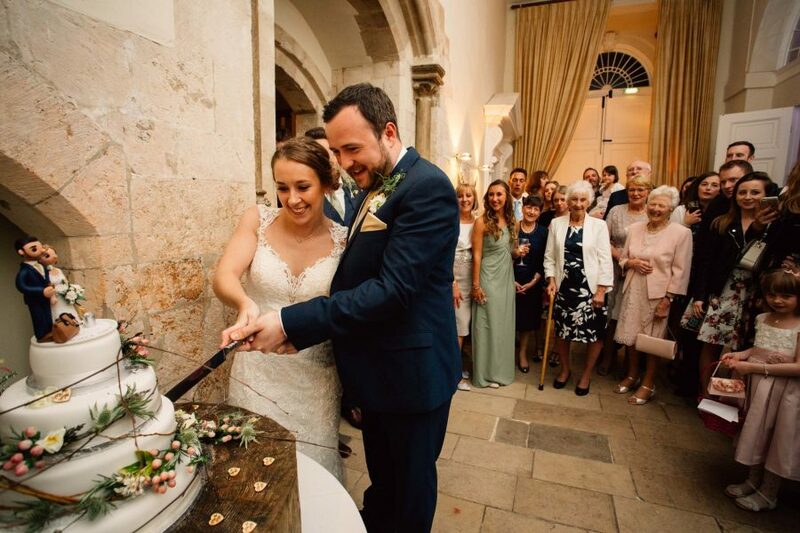 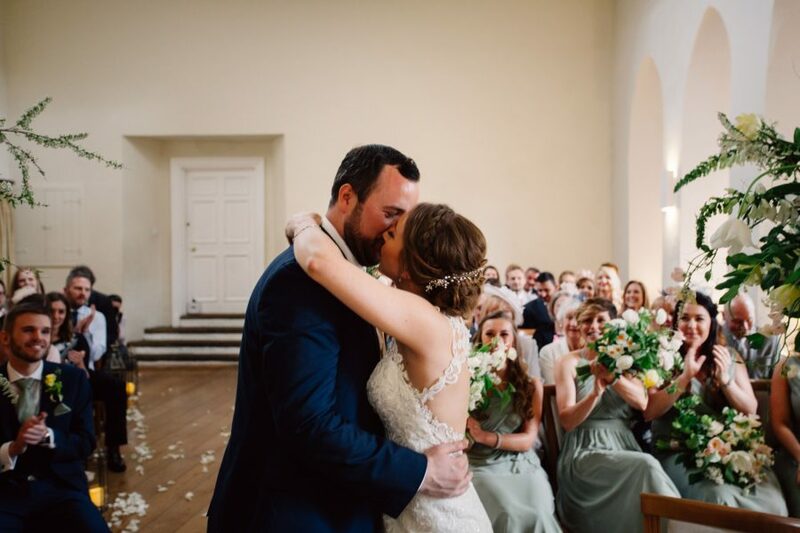 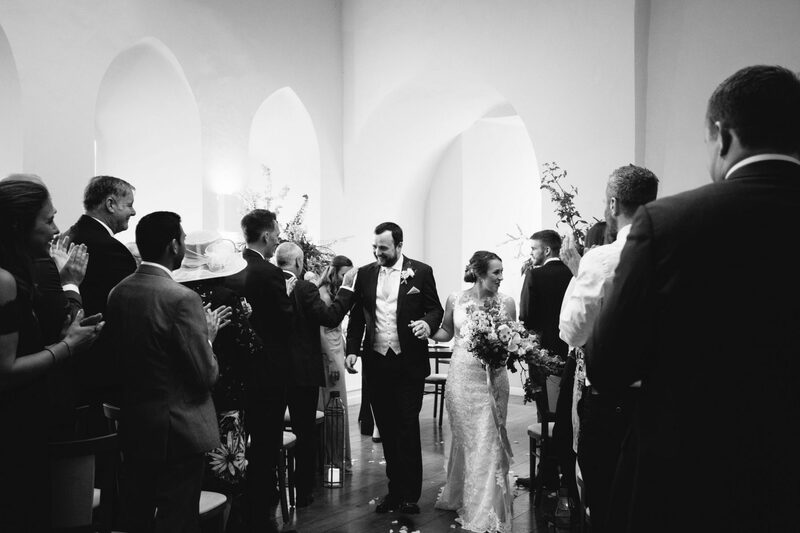 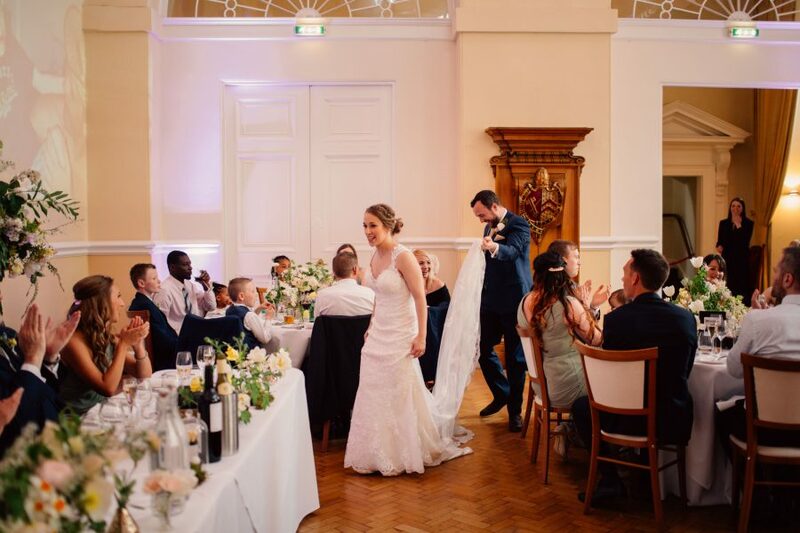 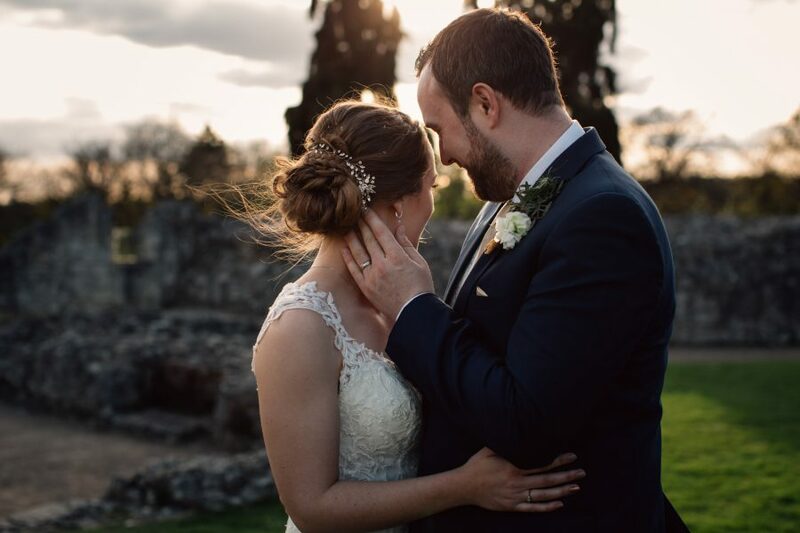 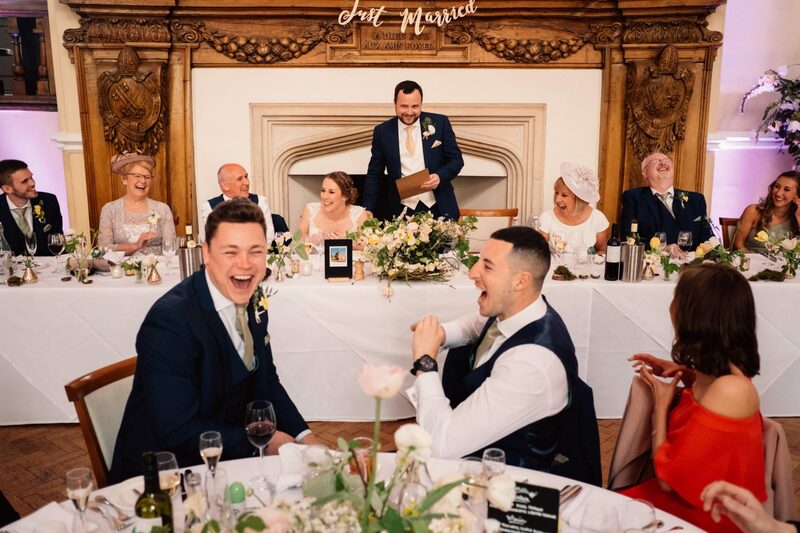 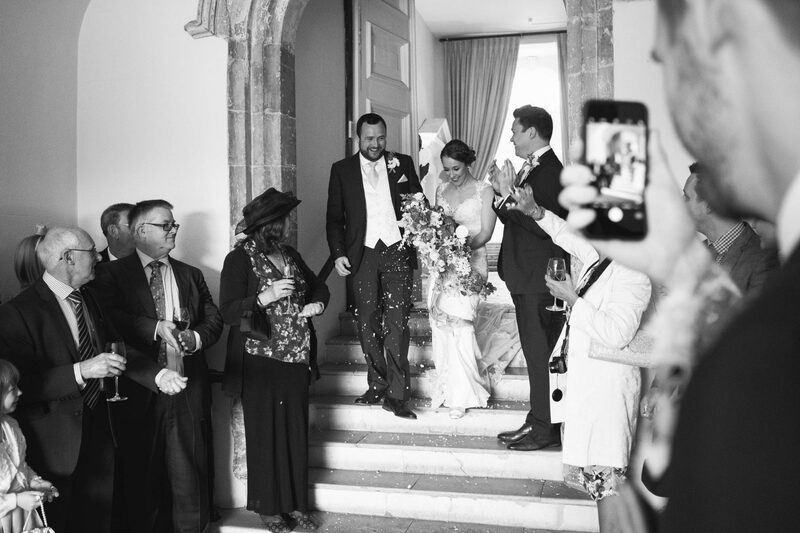 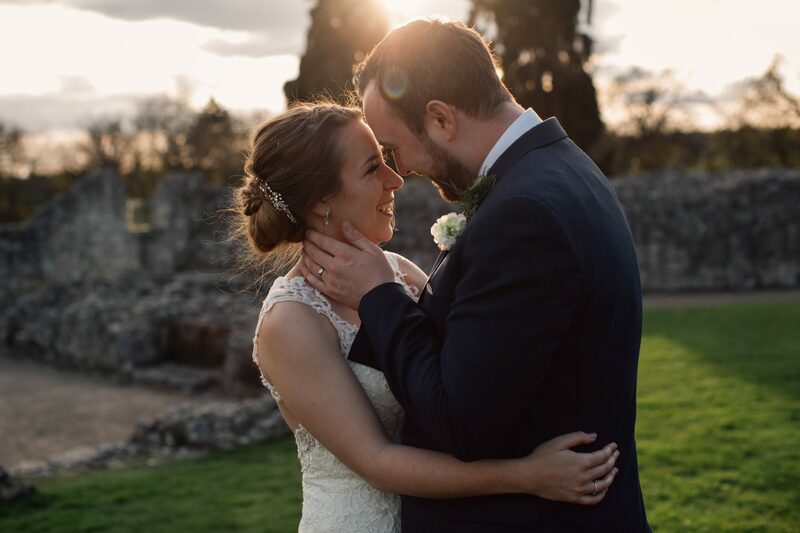 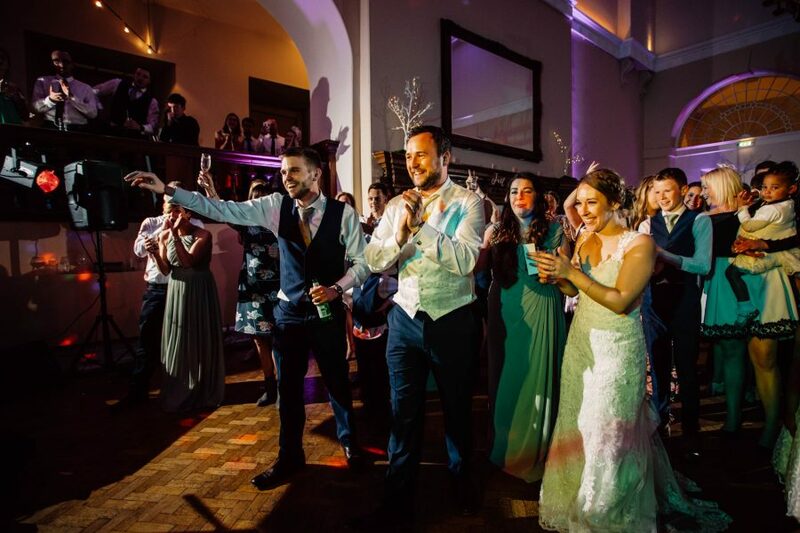 Louise & Scott got married at Farnham Castle in April. 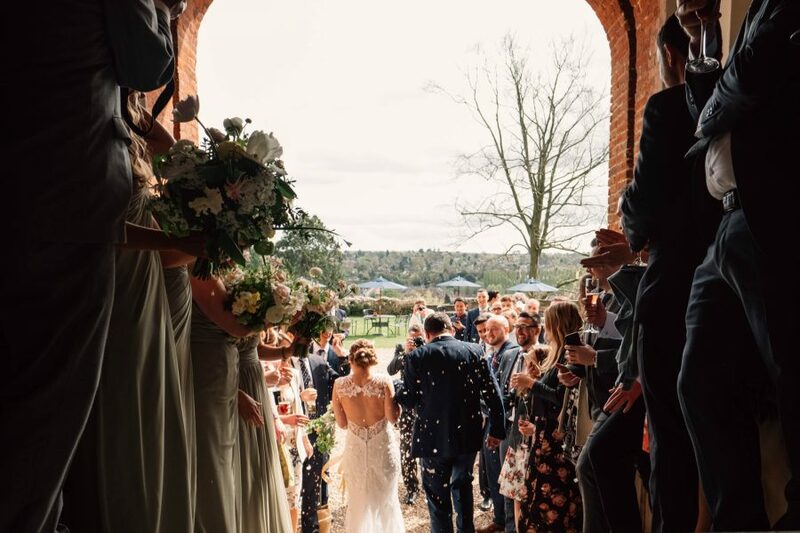 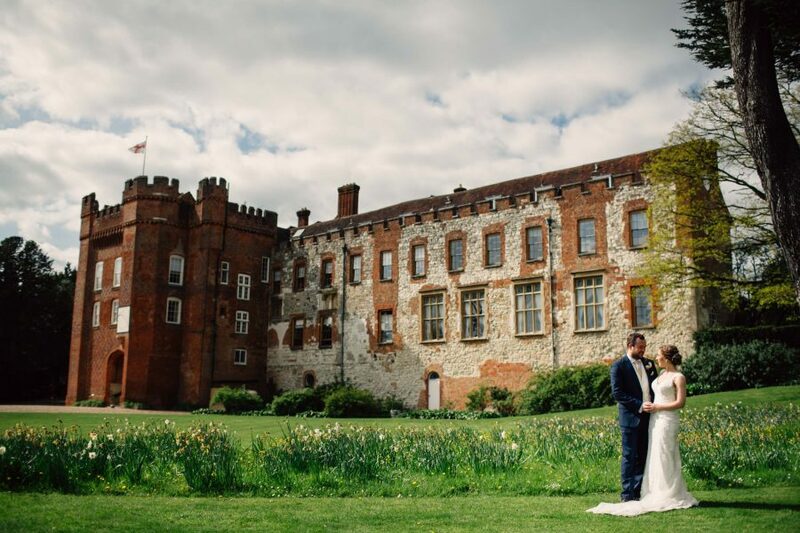 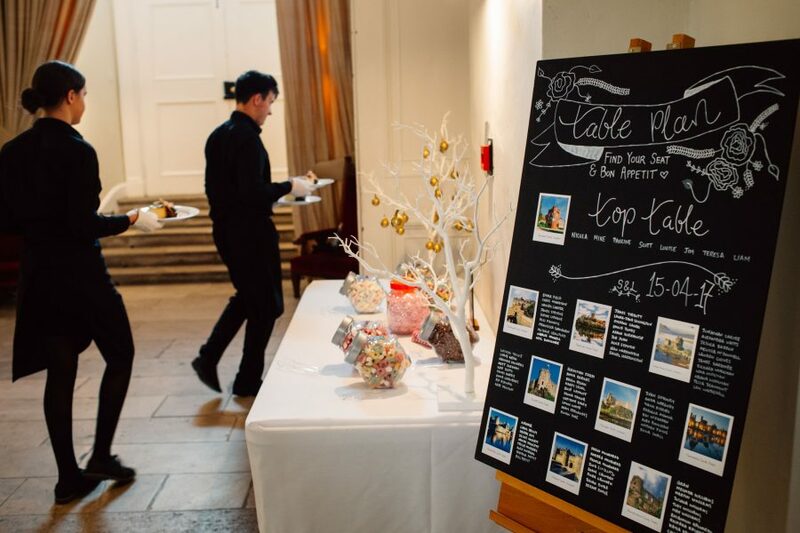 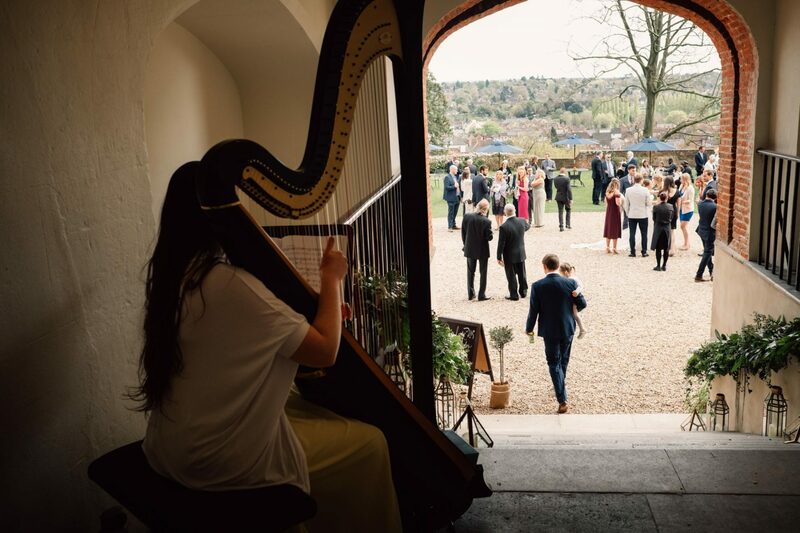 Farnham Castle is such a versatile and pretty wedding venue and I think one of the best wedding venues in Surrey. 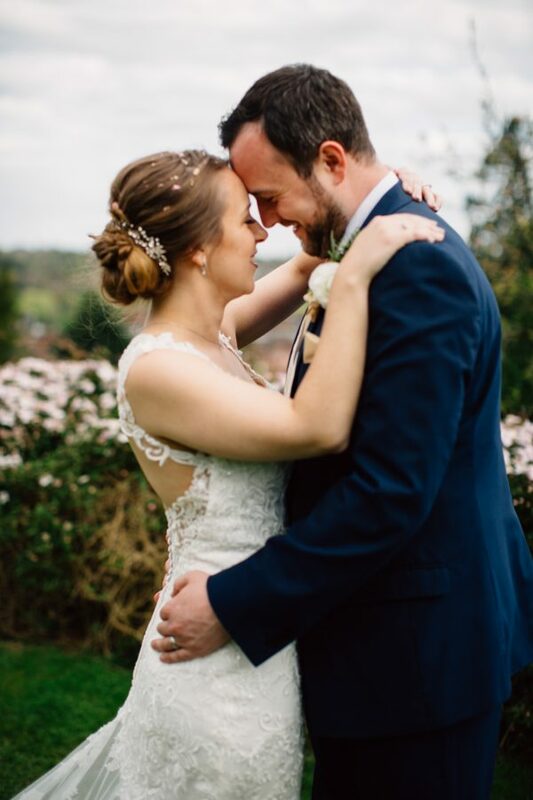 I loved photographing their wedding. 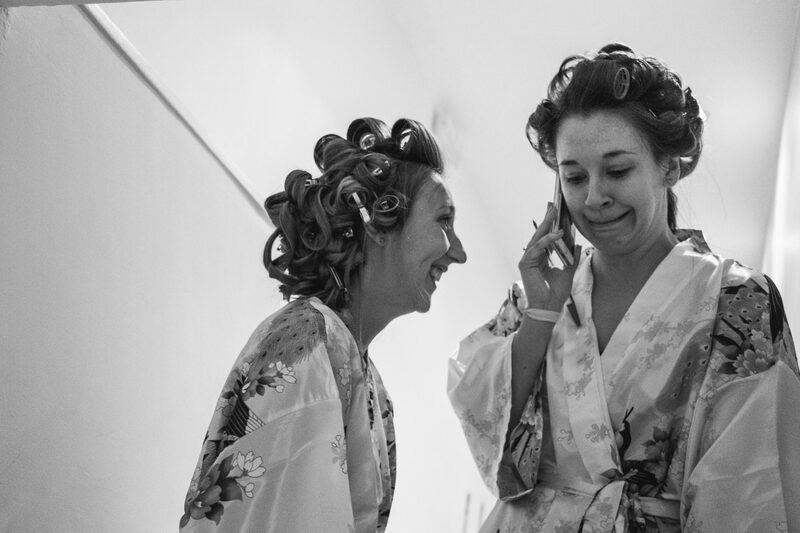 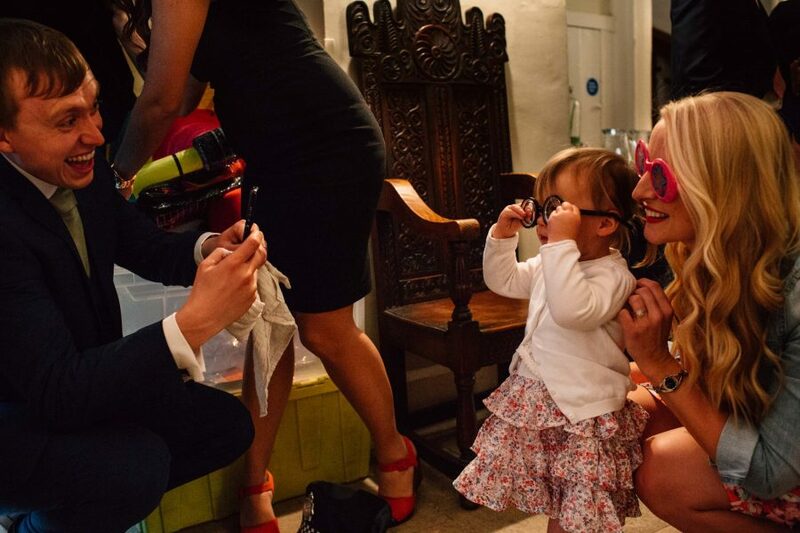 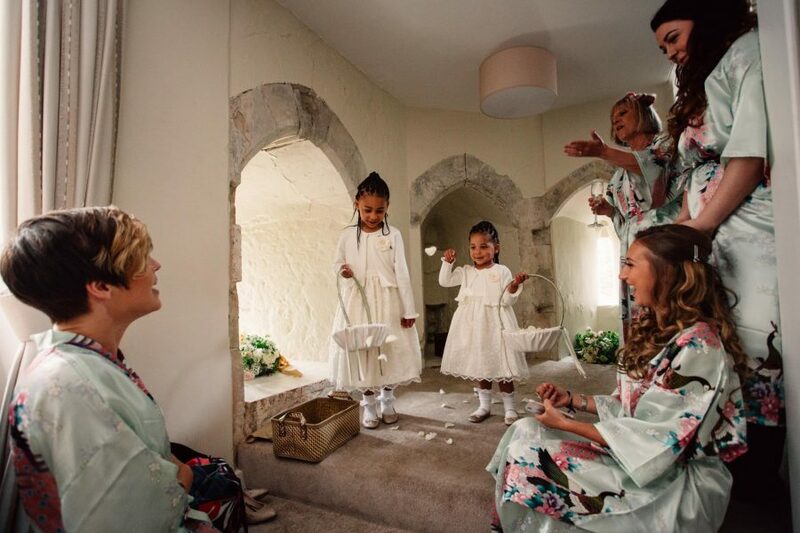 Louise and her bridesmaids got ready in the Gatehouse. 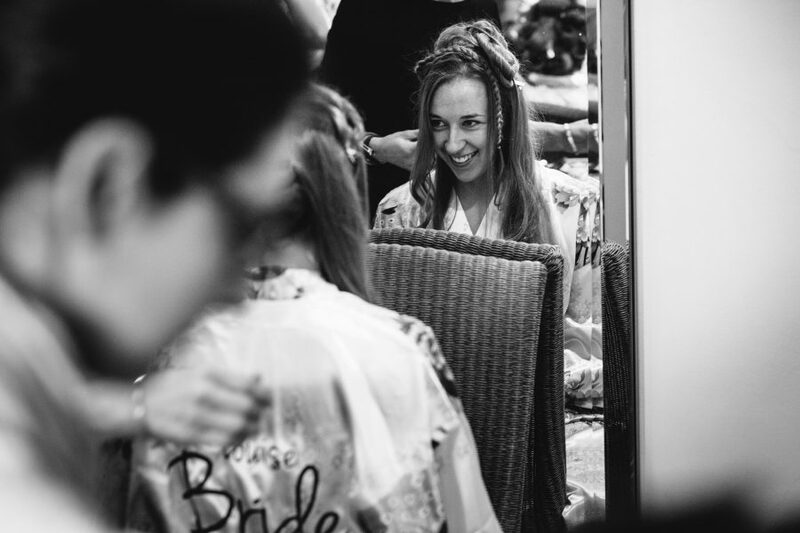 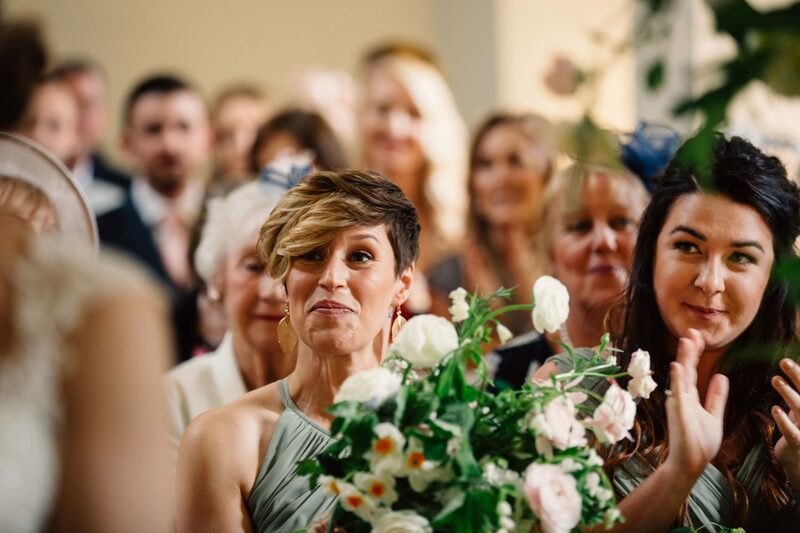 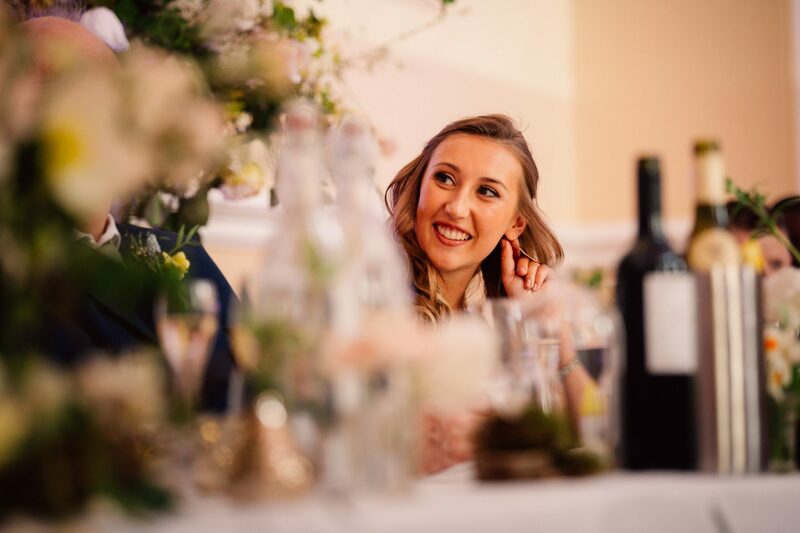 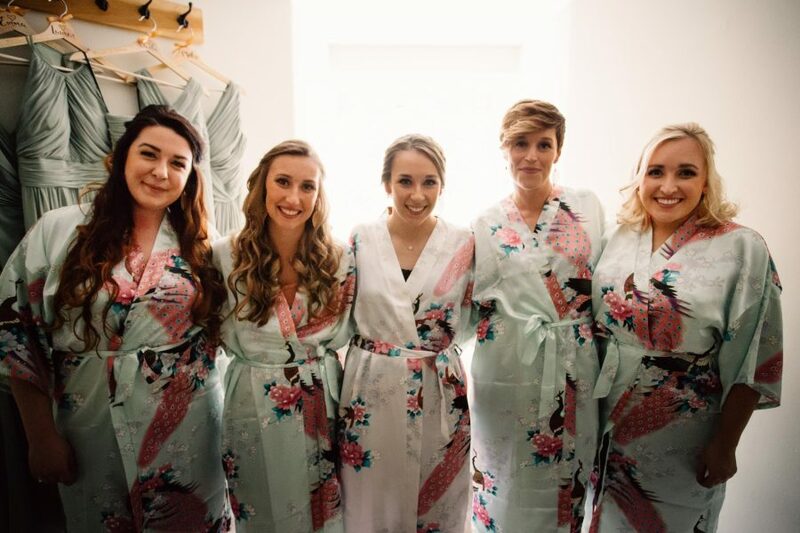 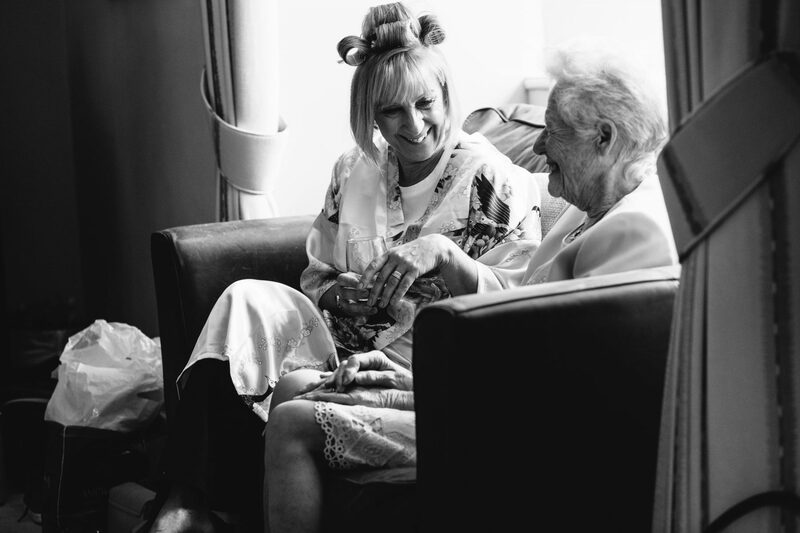 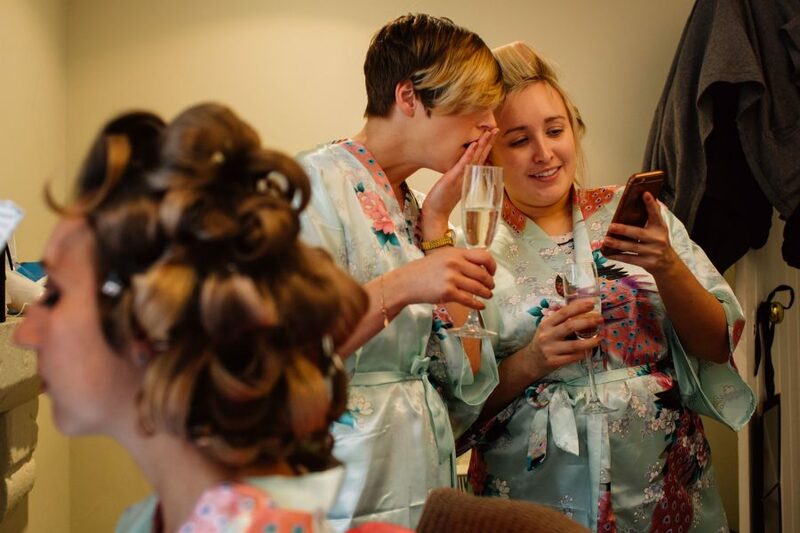 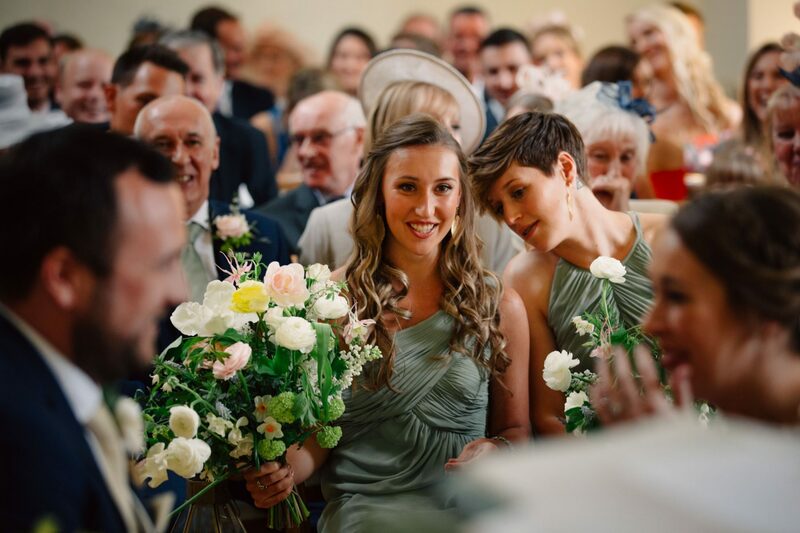 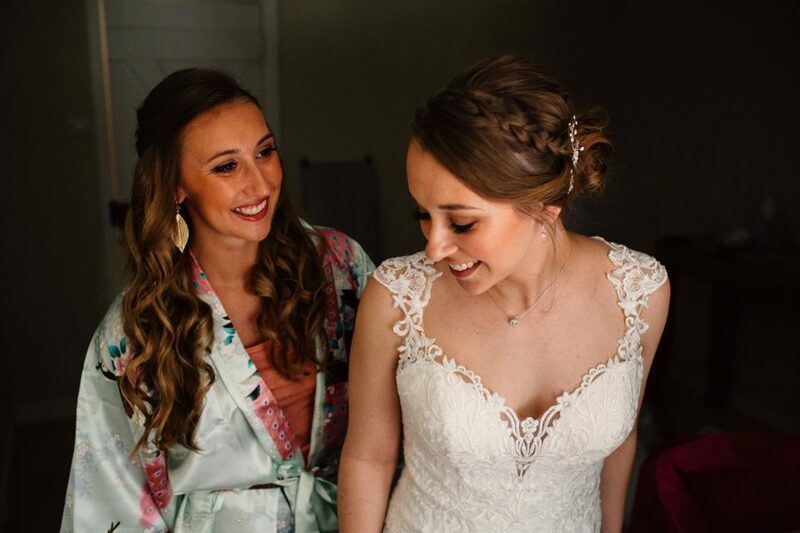 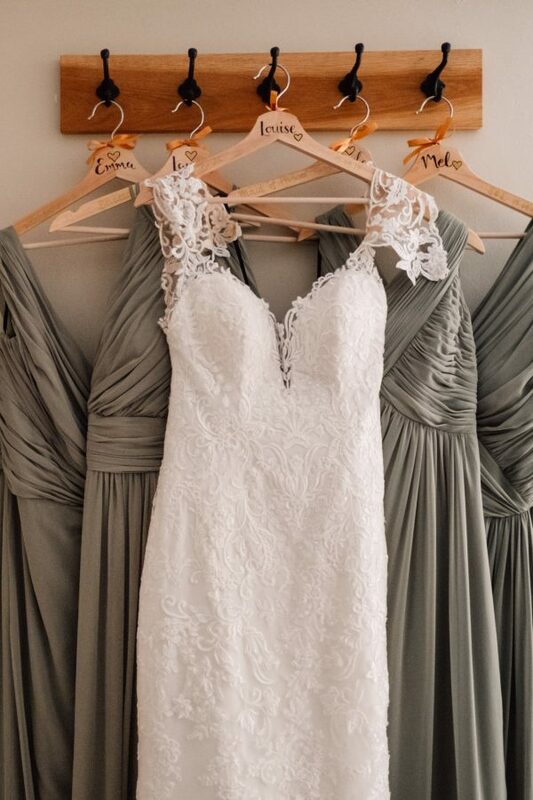 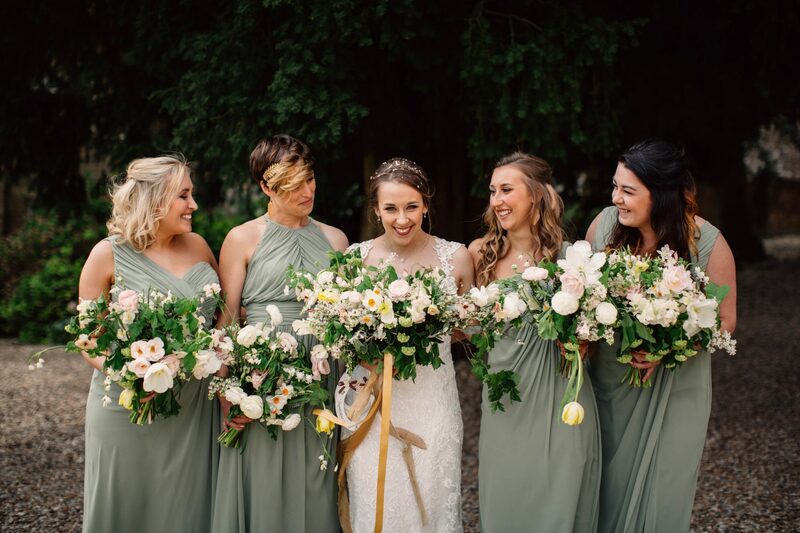 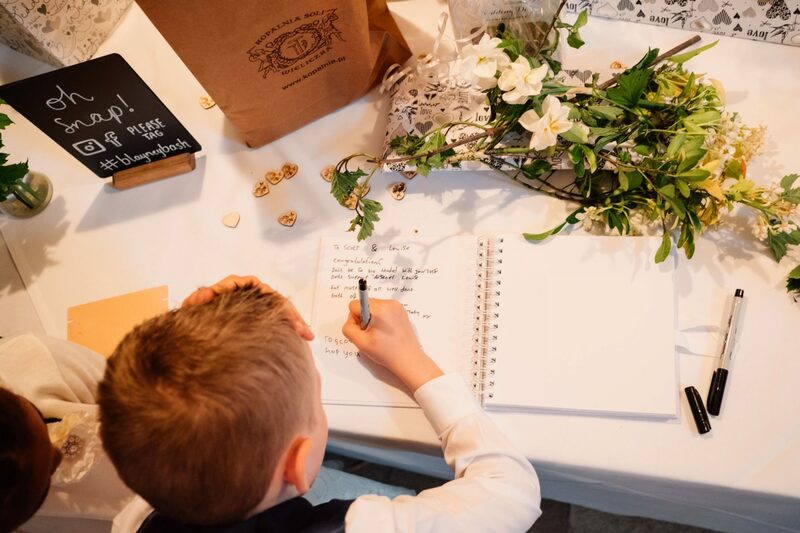 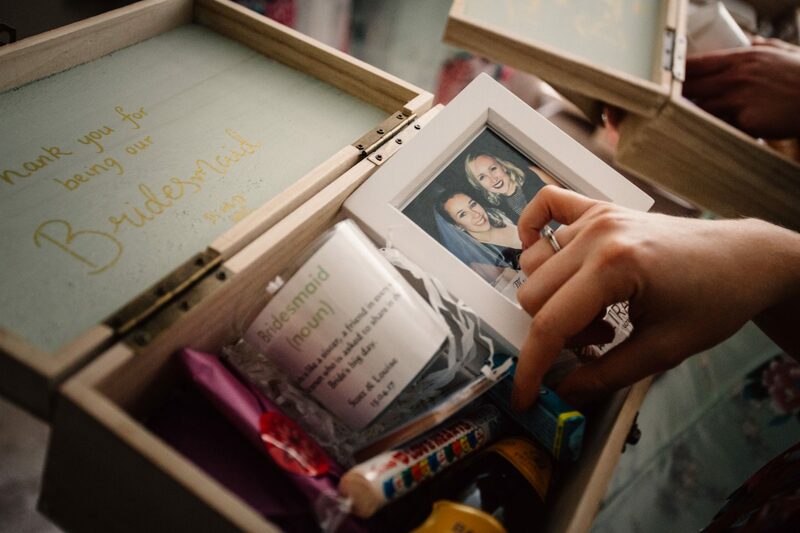 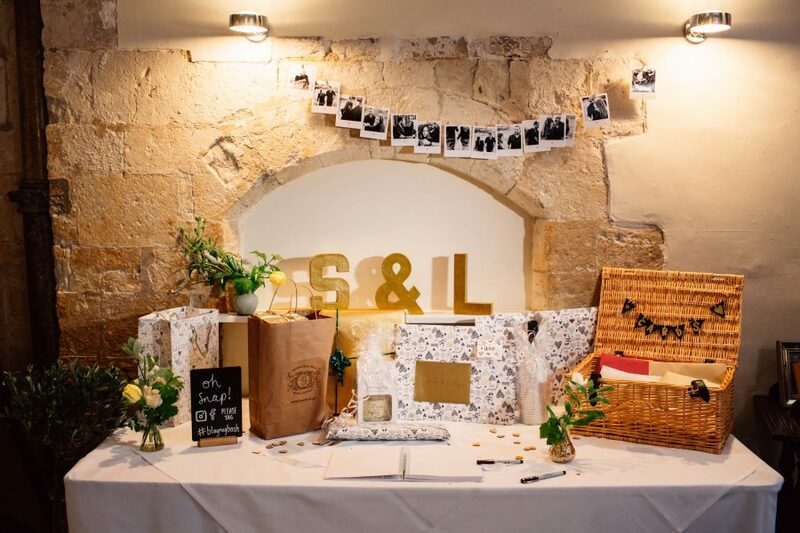 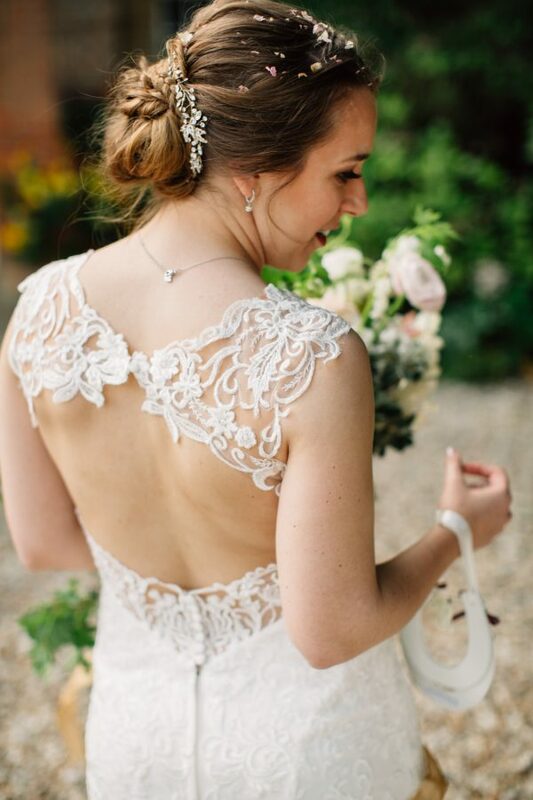 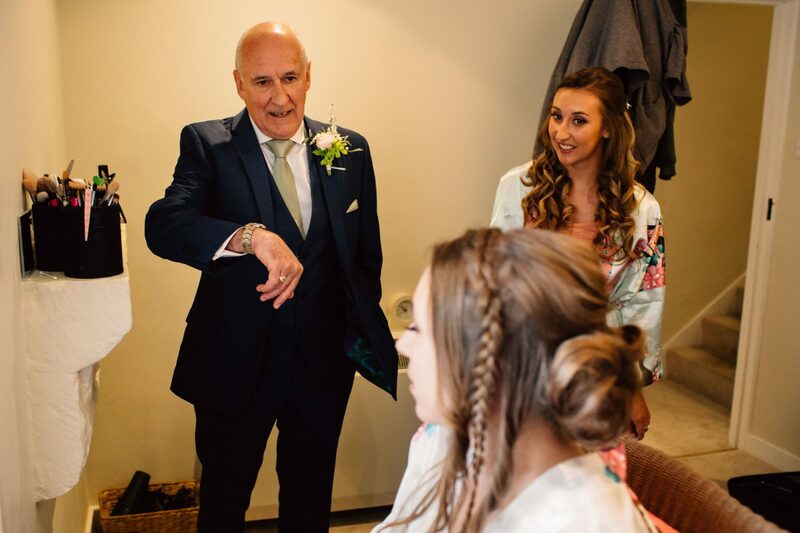 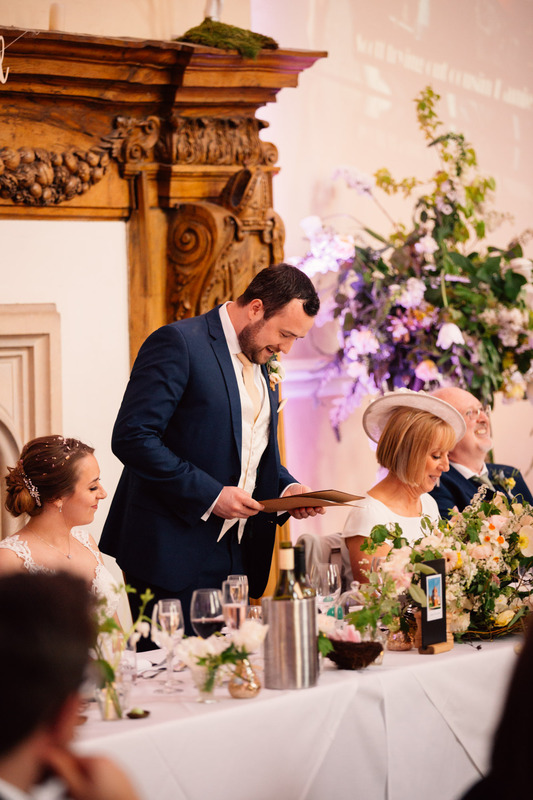 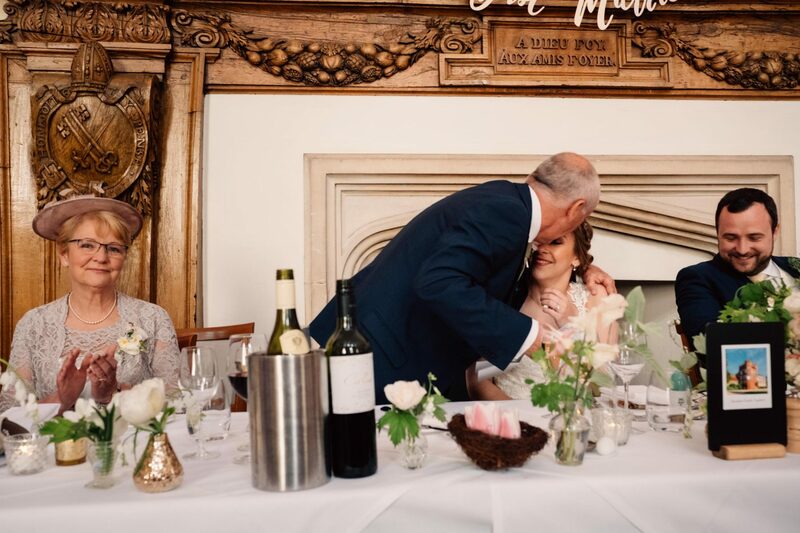 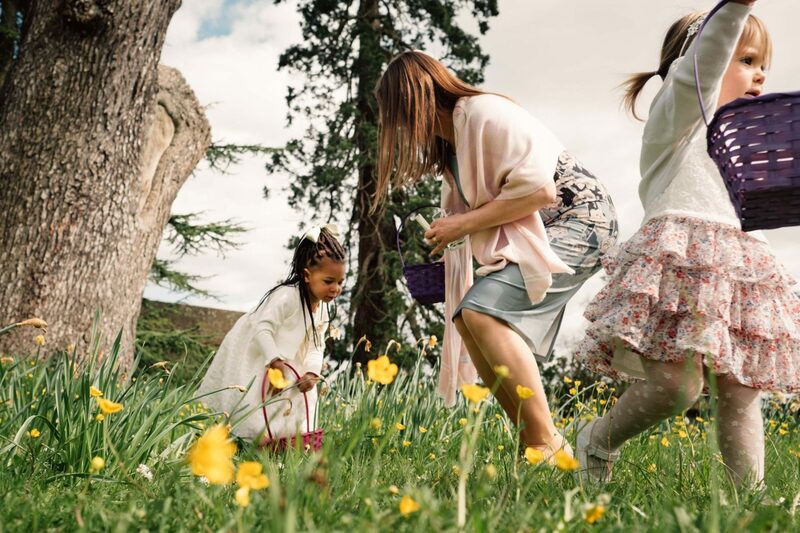 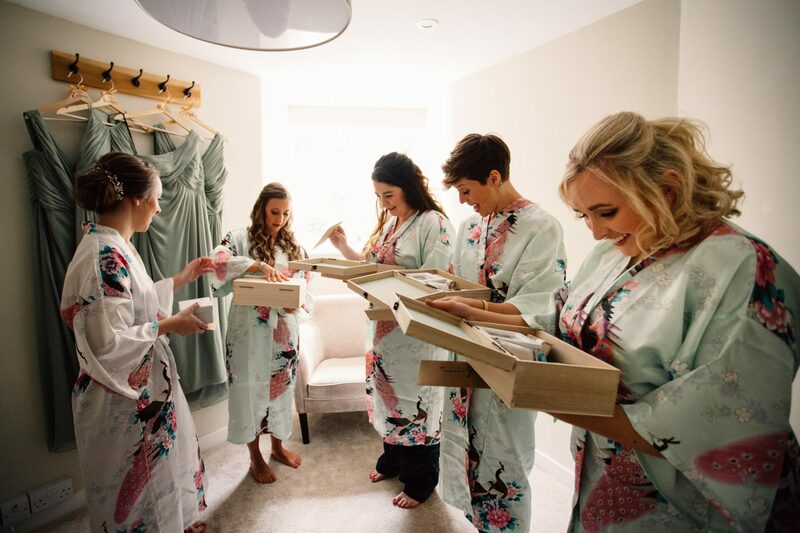 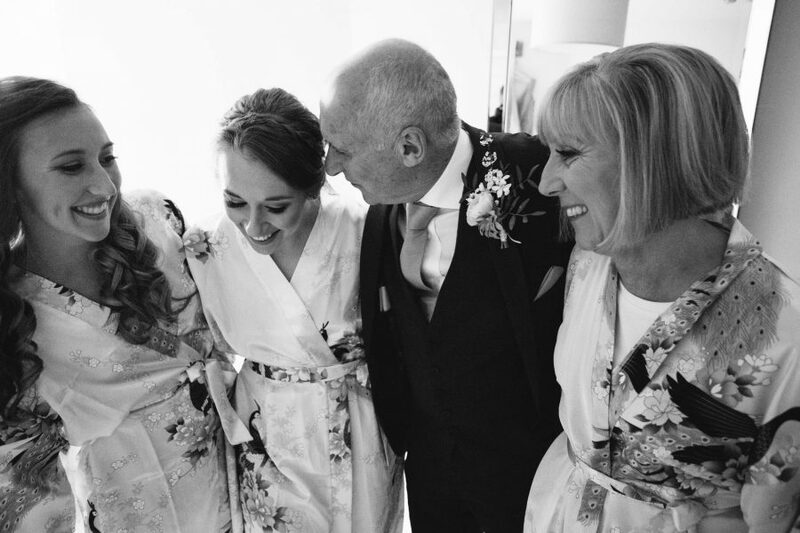 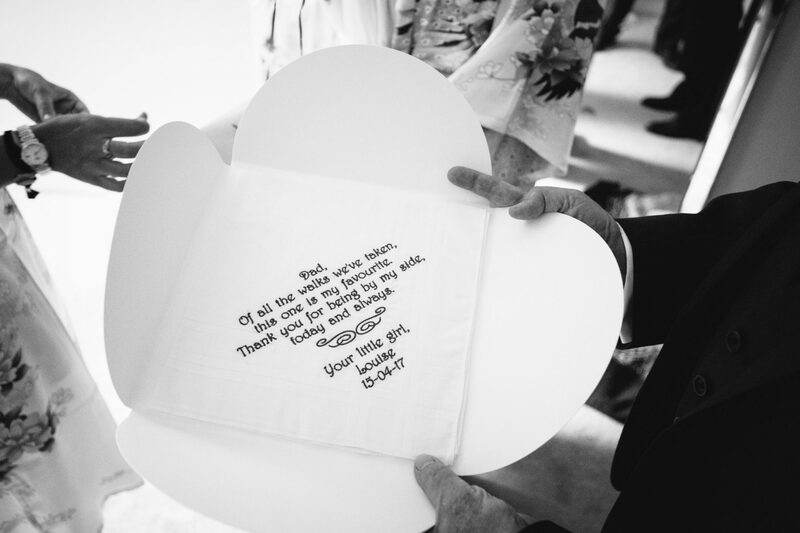 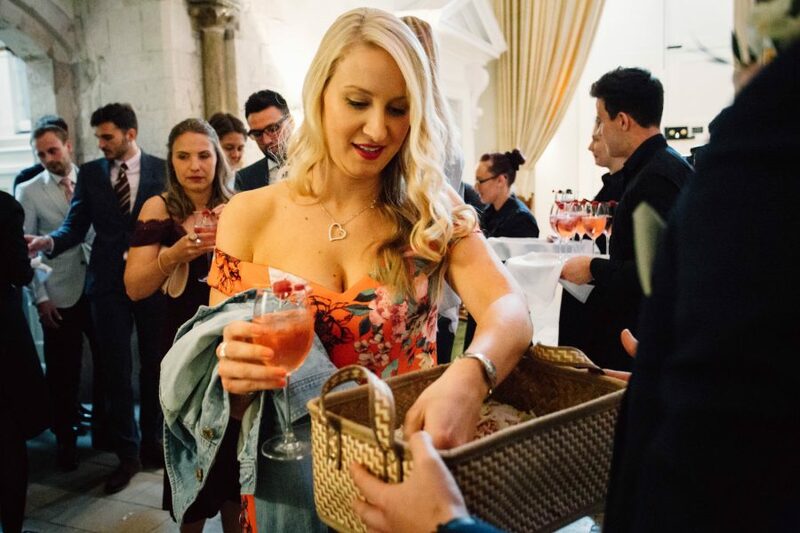 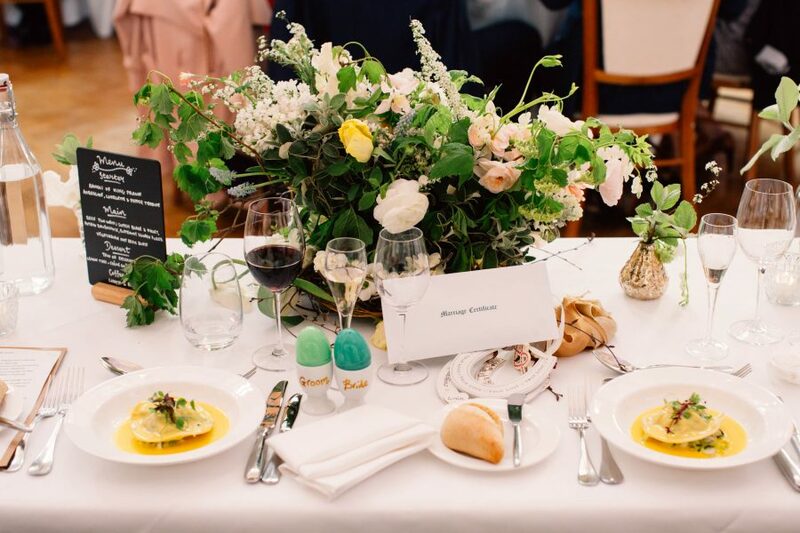 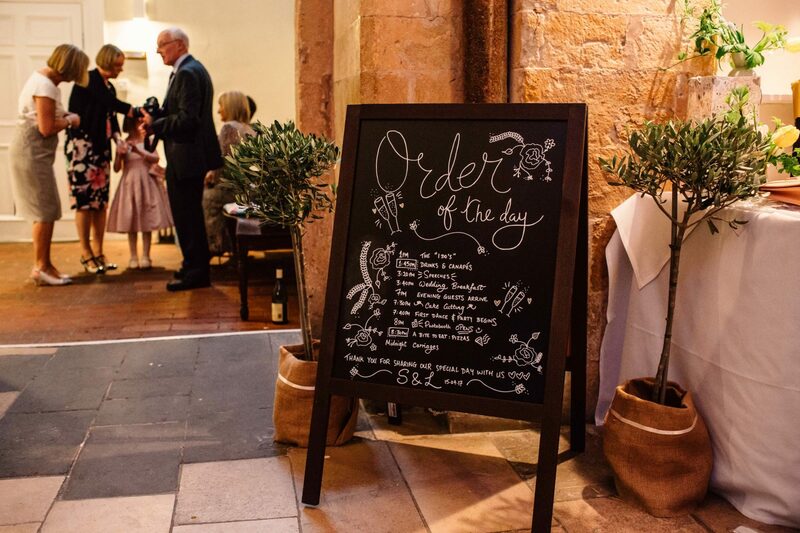 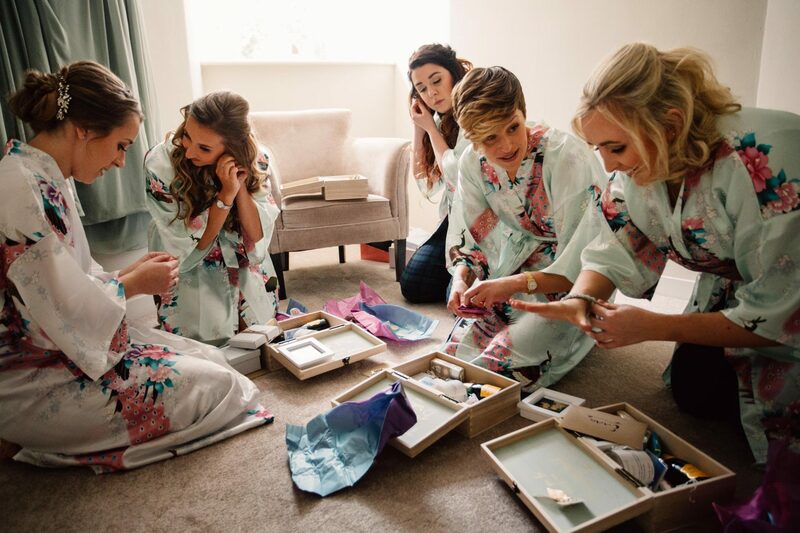 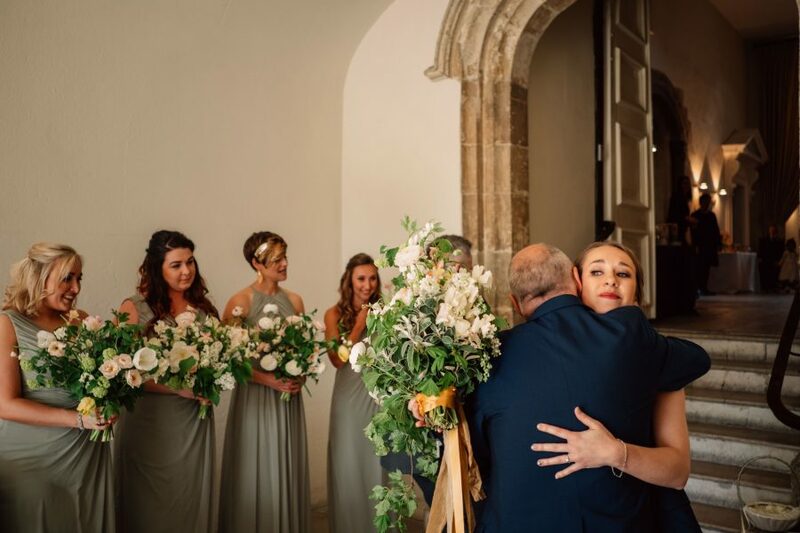 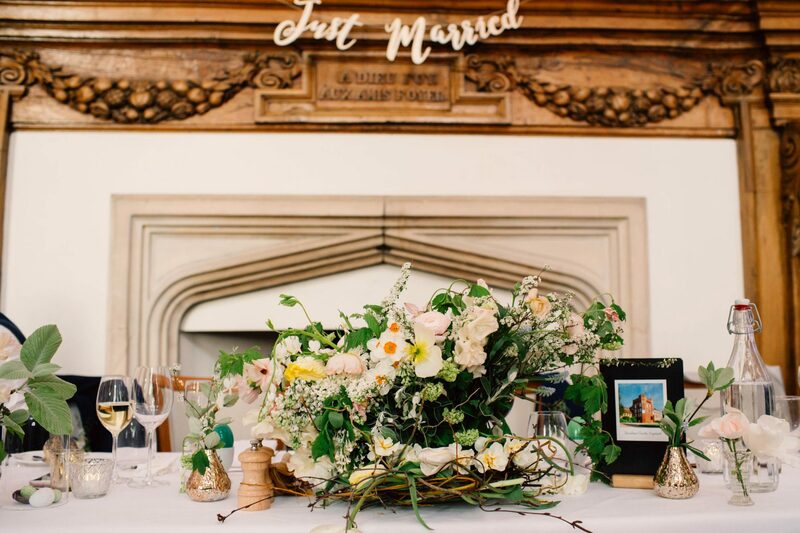 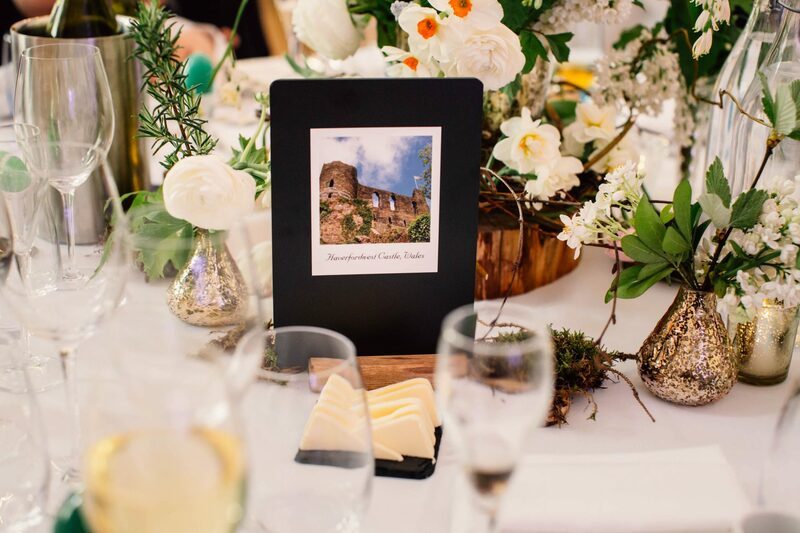 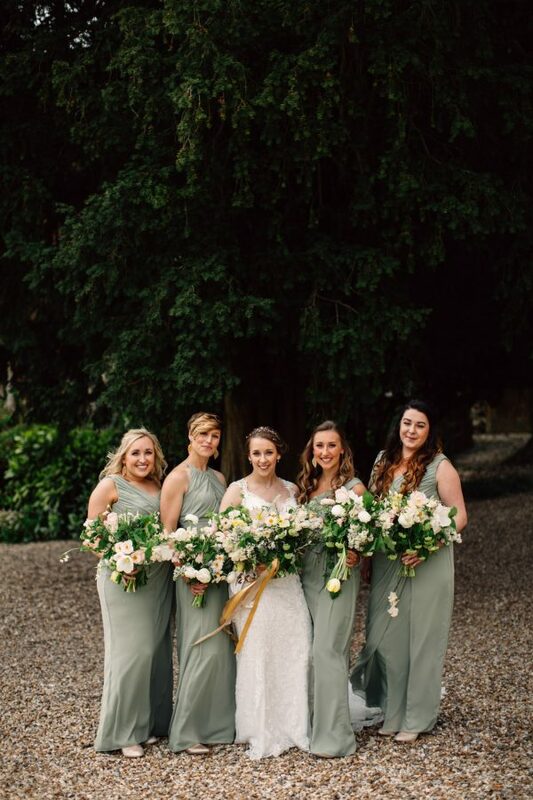 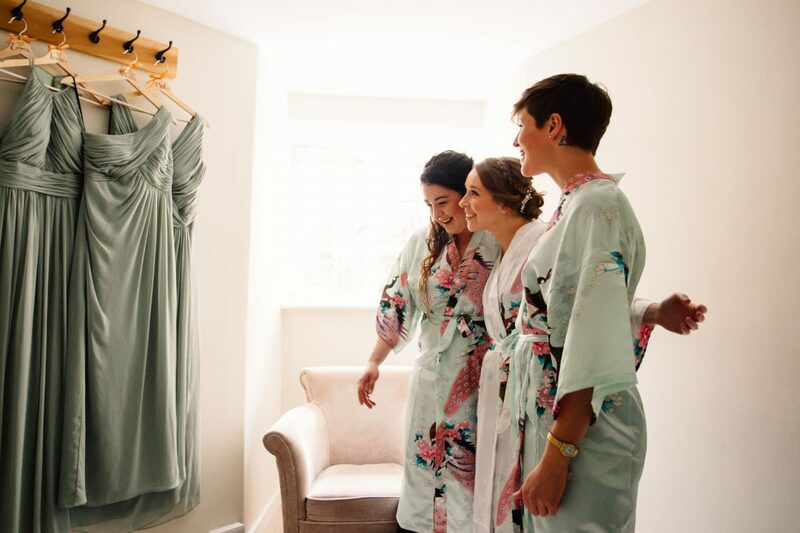 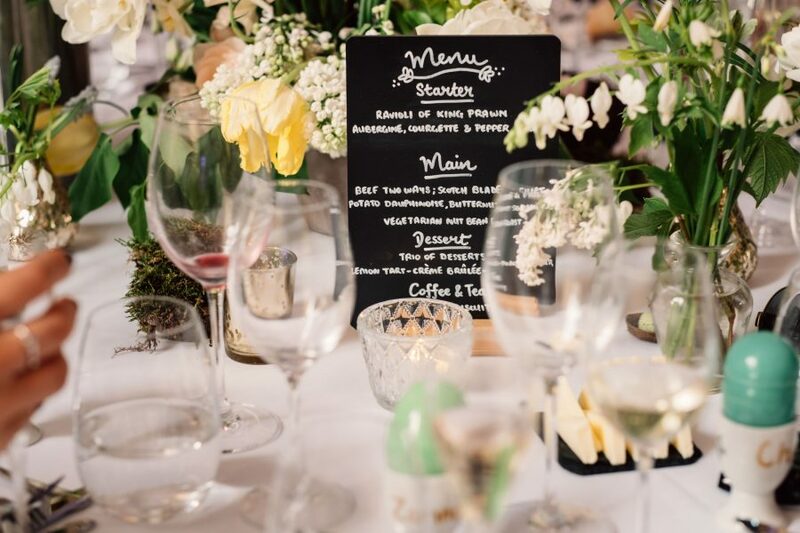 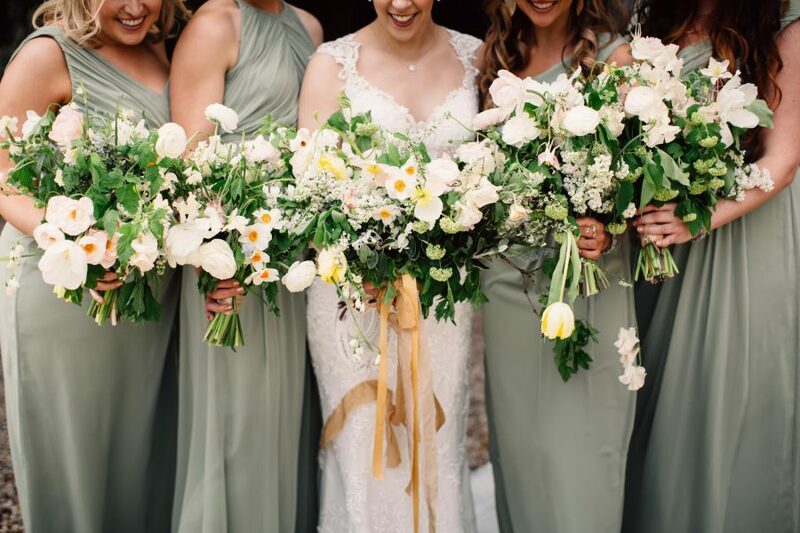 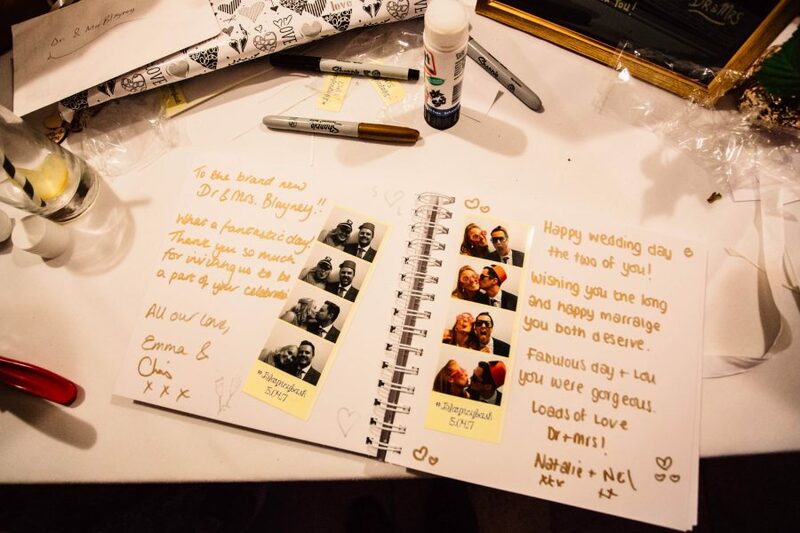 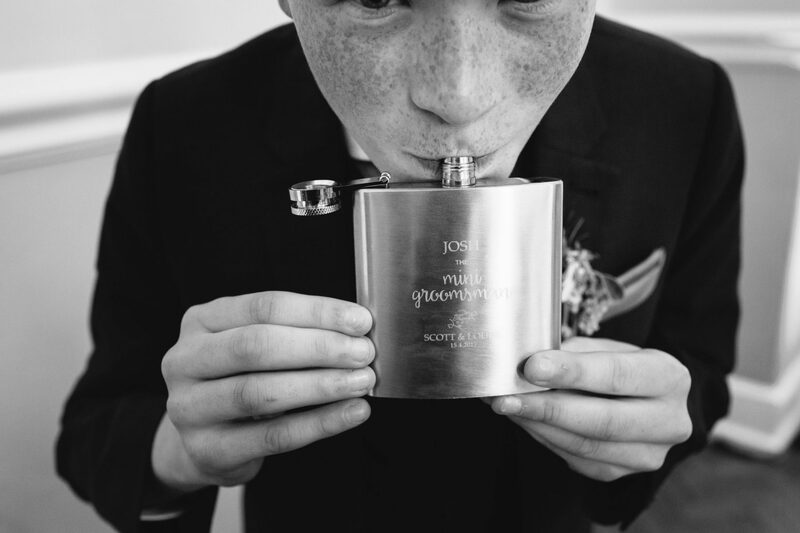 Louise prepared the most beautiful personalised gifts for each of her Bridesmaids and the atmosphere before the wedding was beautiful and quite teary! 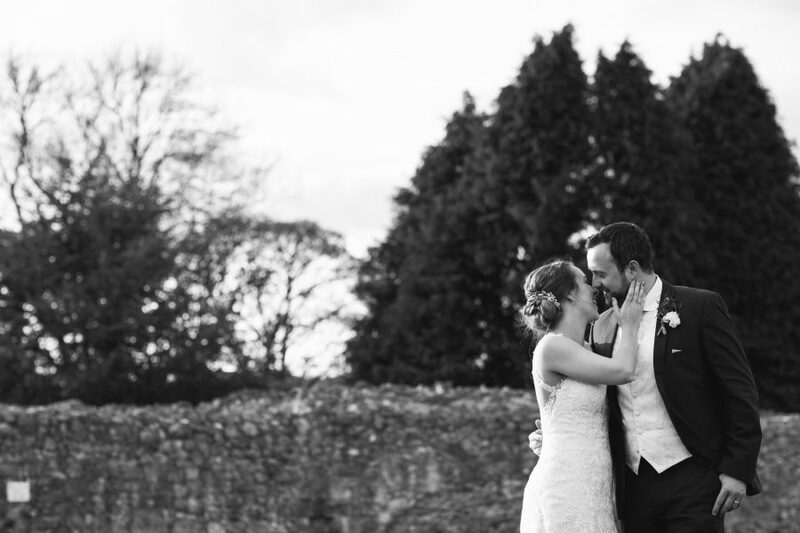 Before the ceremony we stopped for a few moments outside Fox’s Tower to get a few images of the wedding party. 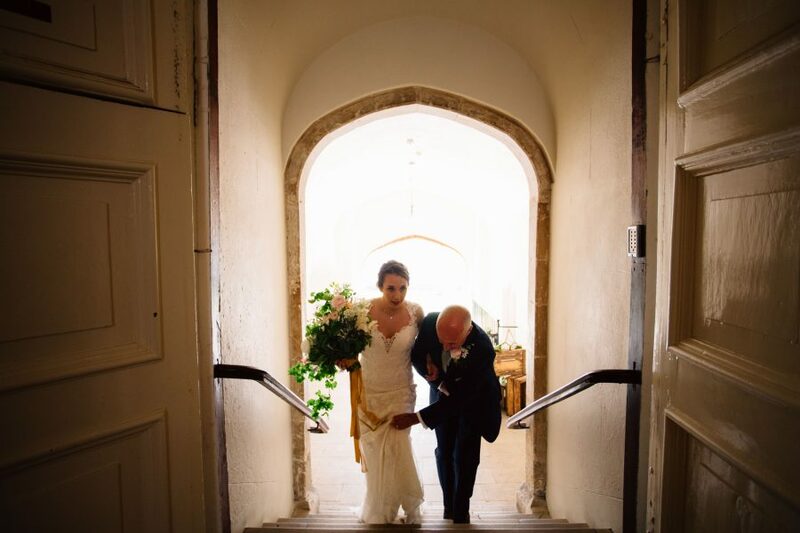 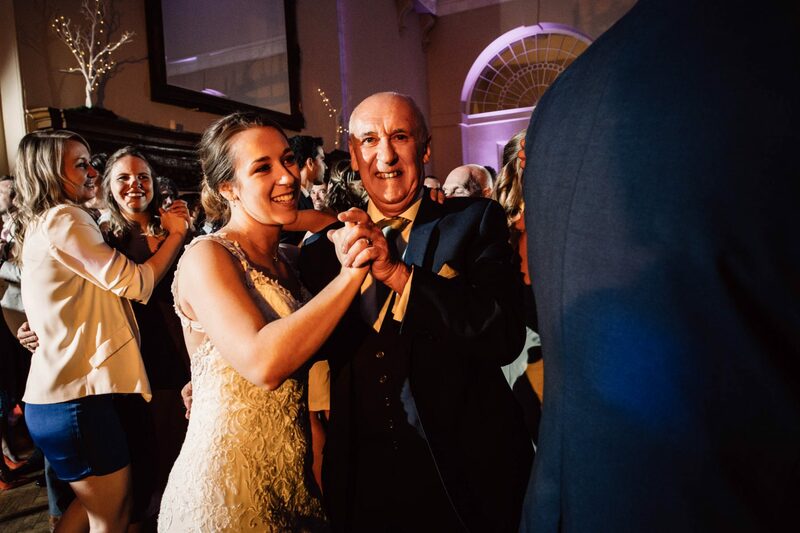 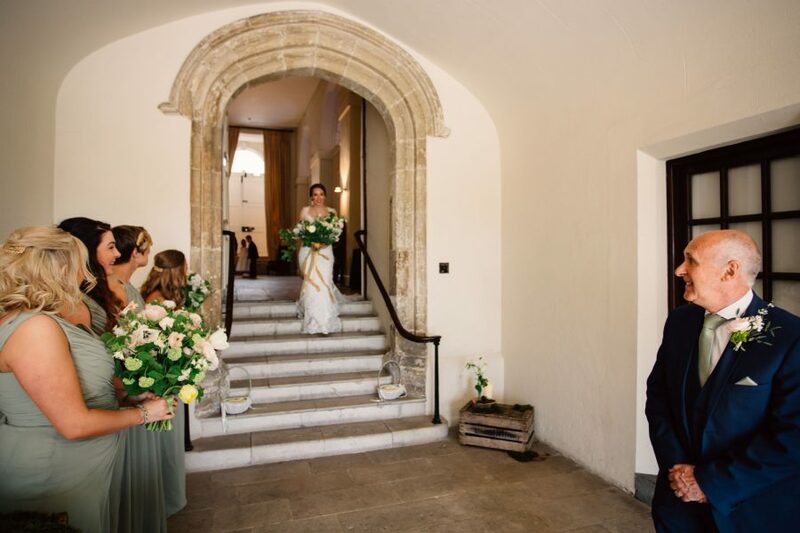 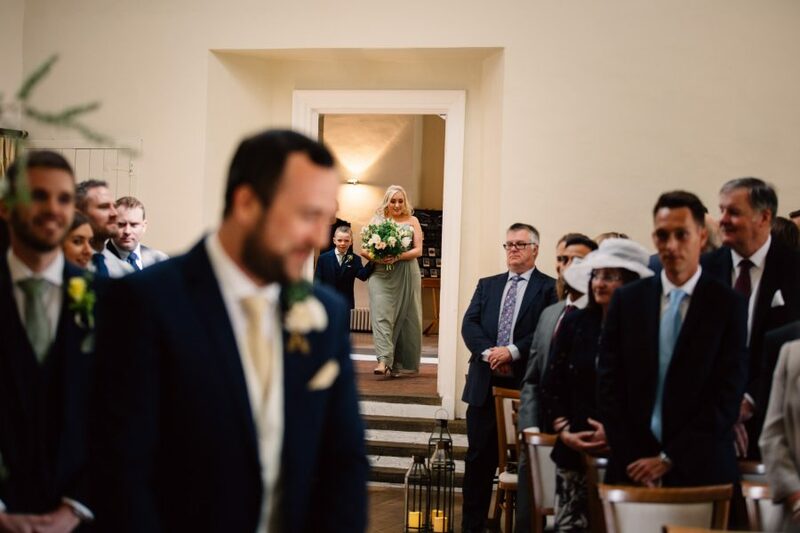 Then Louise ascended the grand stone staircase into The Stone Hall to meet her father before the ceremony. 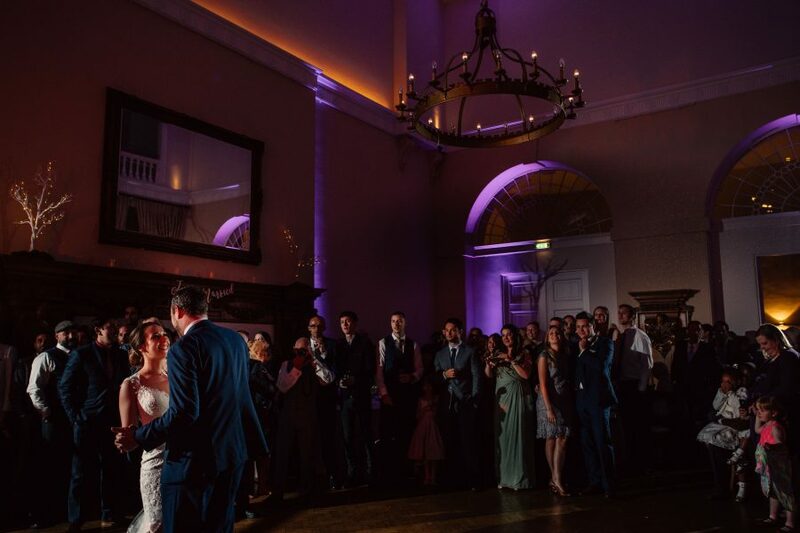 The Ceremony took place in The Lantern Hall. 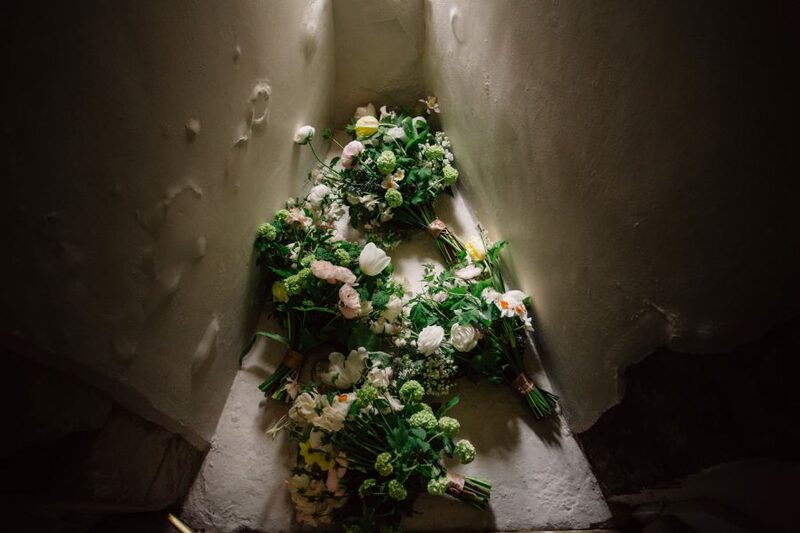 The hall was artfully decorated with beautiful wedding floral arrangements by the very talented Jay Archer Blooms. 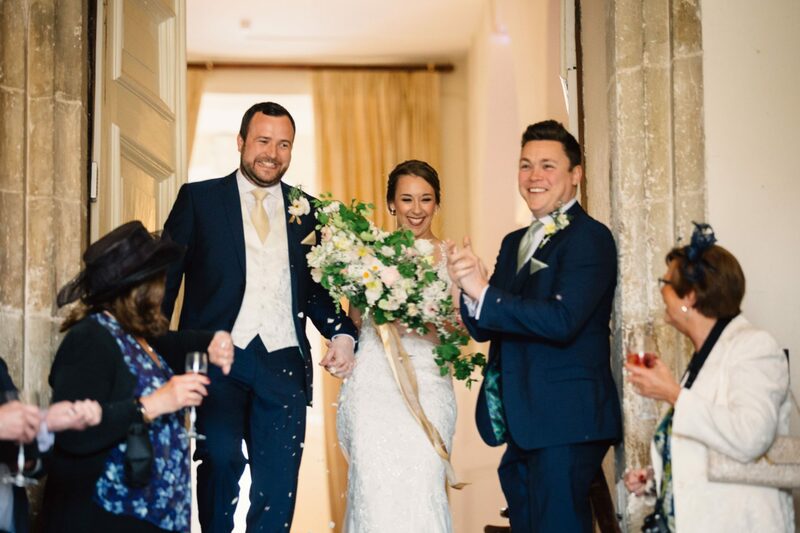 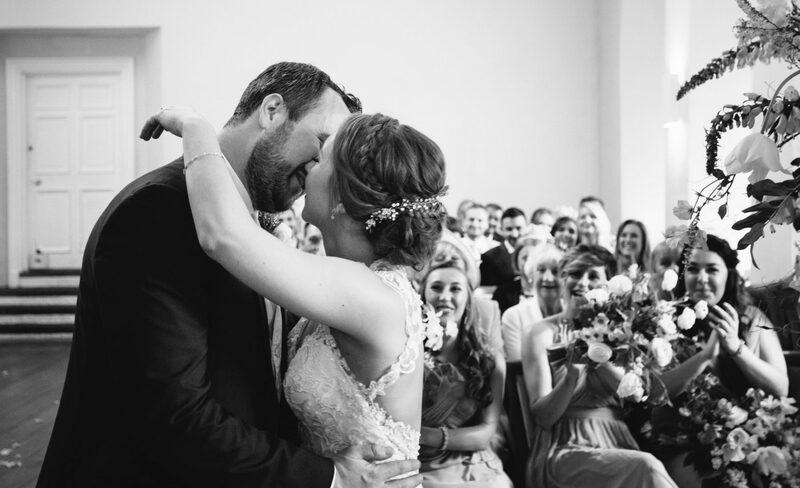 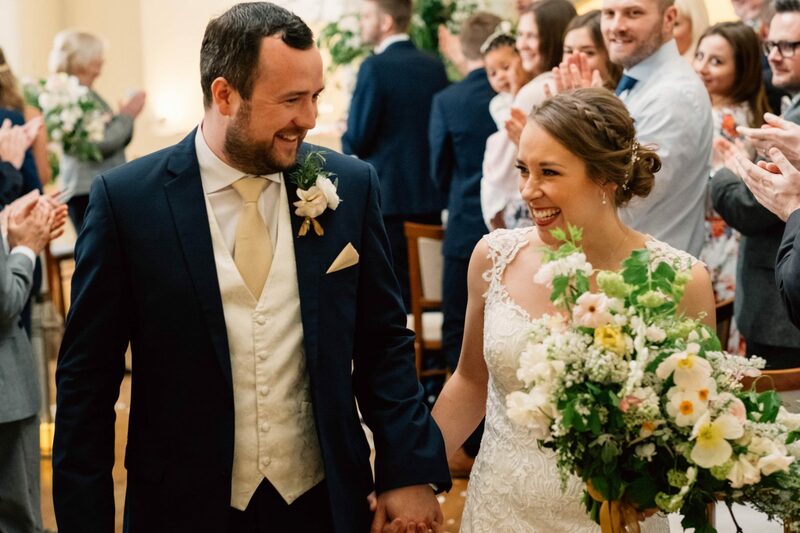 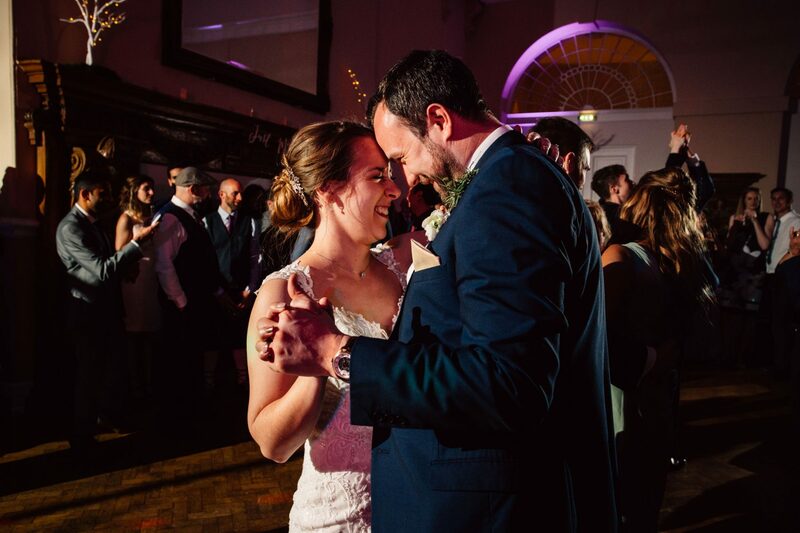 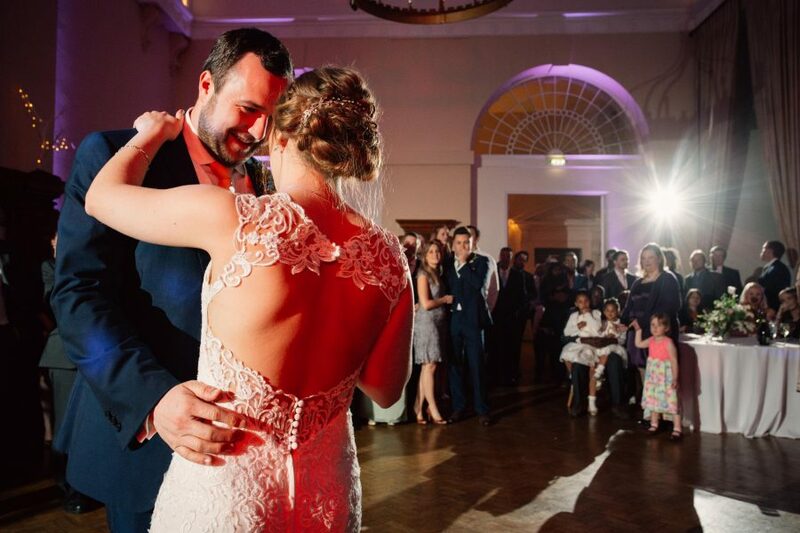 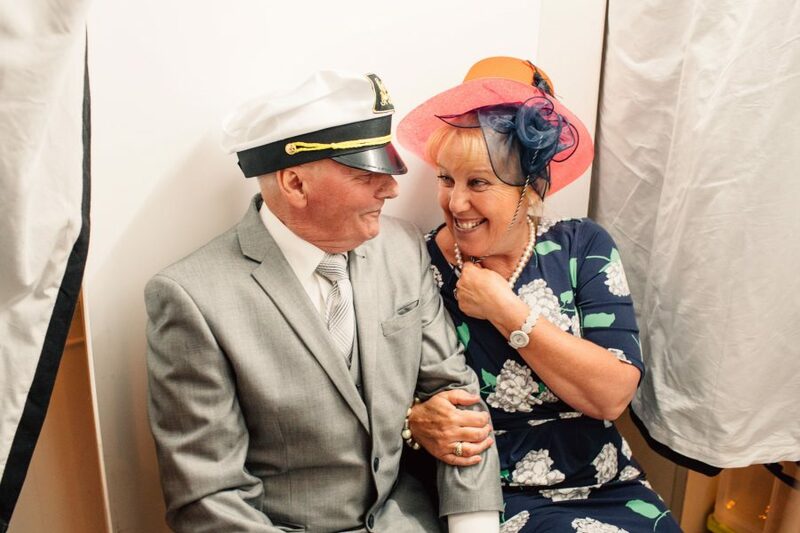 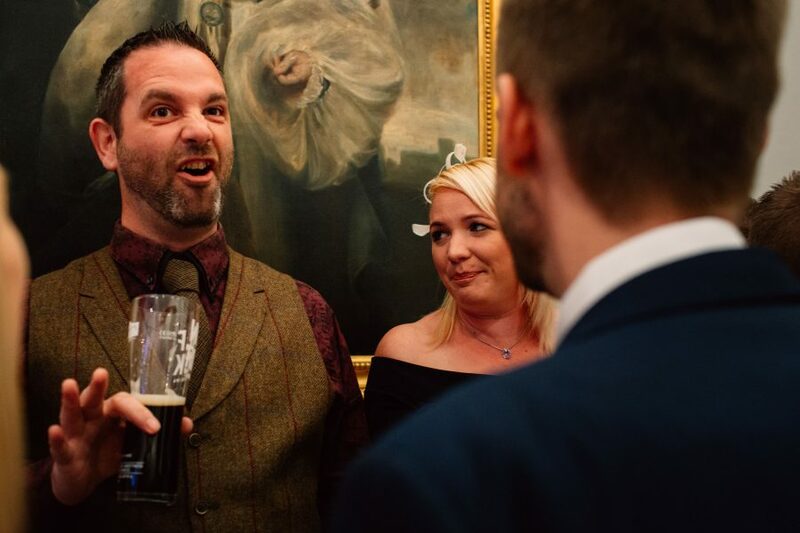 Louise and Scott were the happiest couple and grinned all the way through their wedding vows. 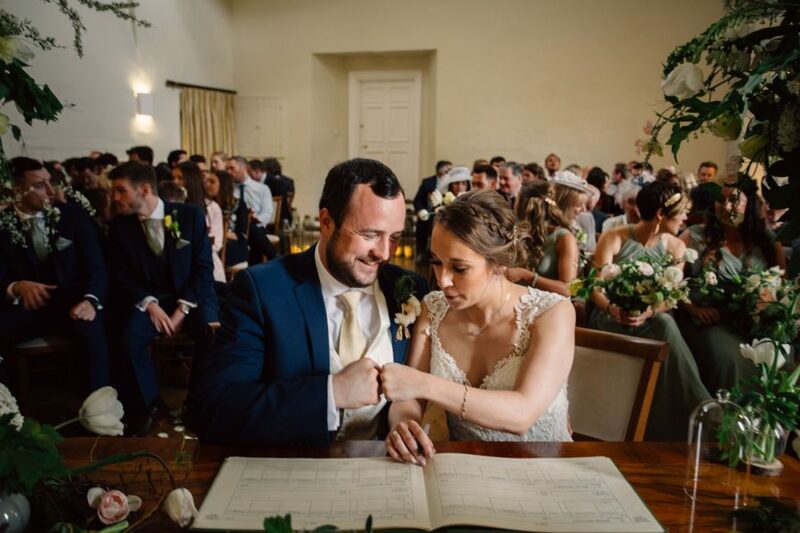 I really loved their fist bump when they signed the register! 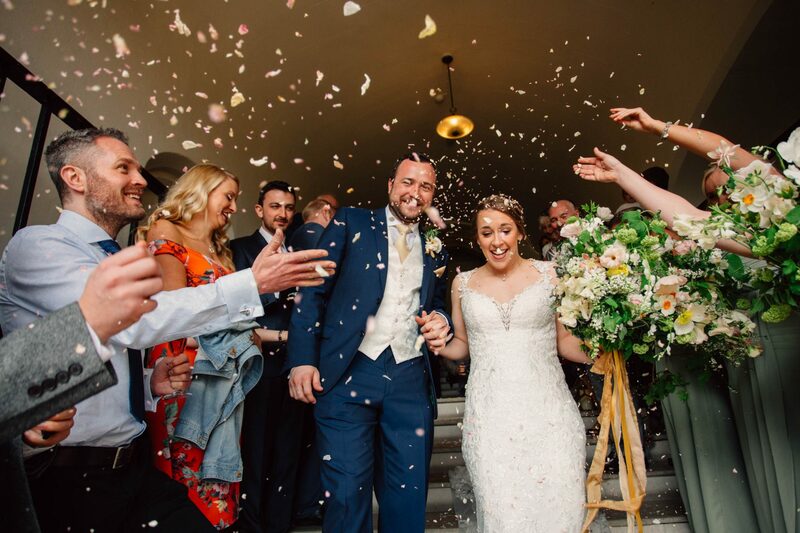 Following lots of confetti throwing, Louise and Scott took a walk in the Castle grounds and caught up on their day. 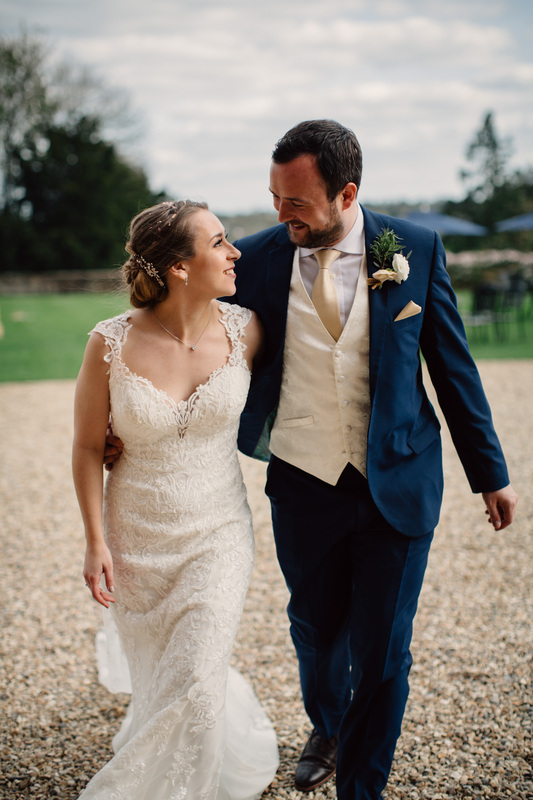 I captured some natural portraits capturing Louise’s beautiful Stella York wedding dress and Scott’s unending grin. 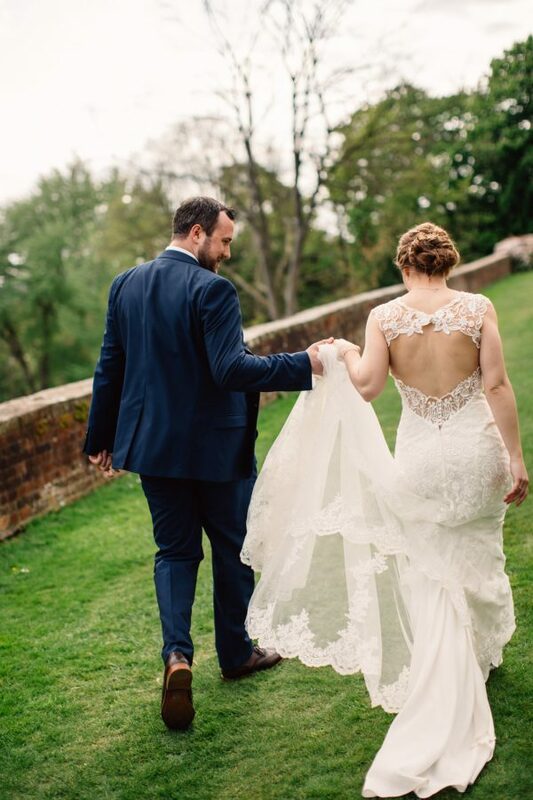 The Great Lawn is an amazing location for natural wedding portraits. 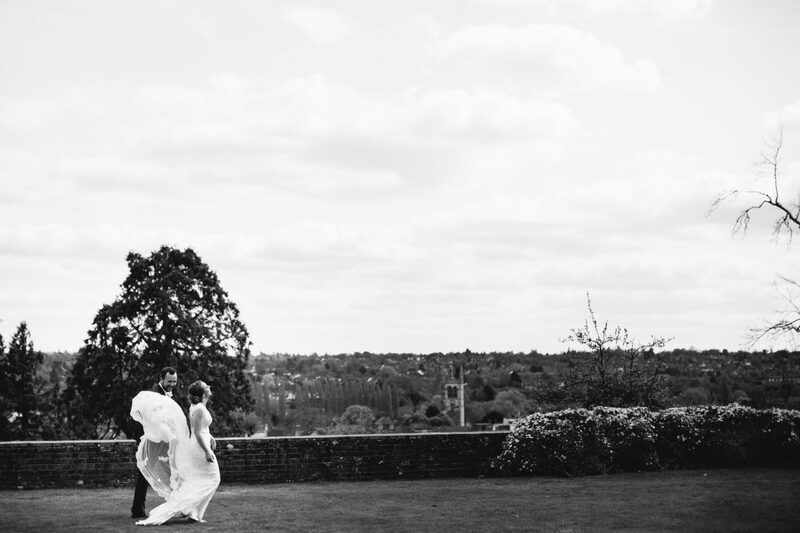 The views over Farnham from the castle grounds are stunning and the light is wonderful. 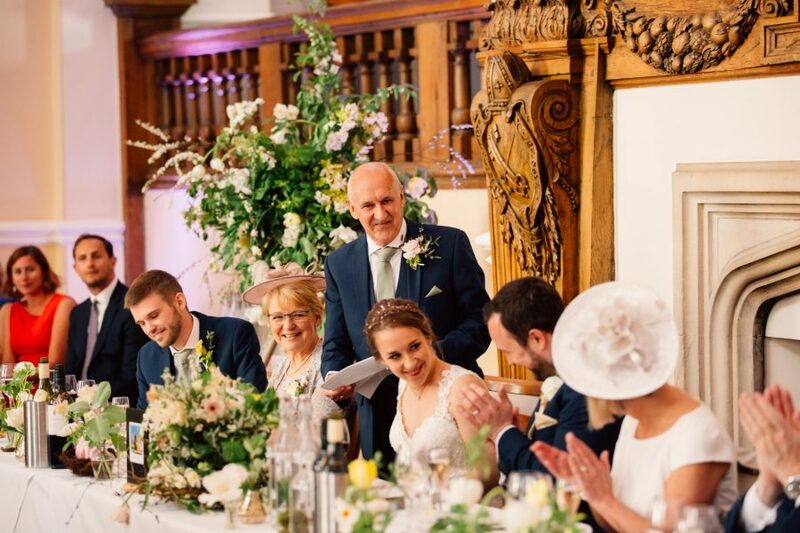 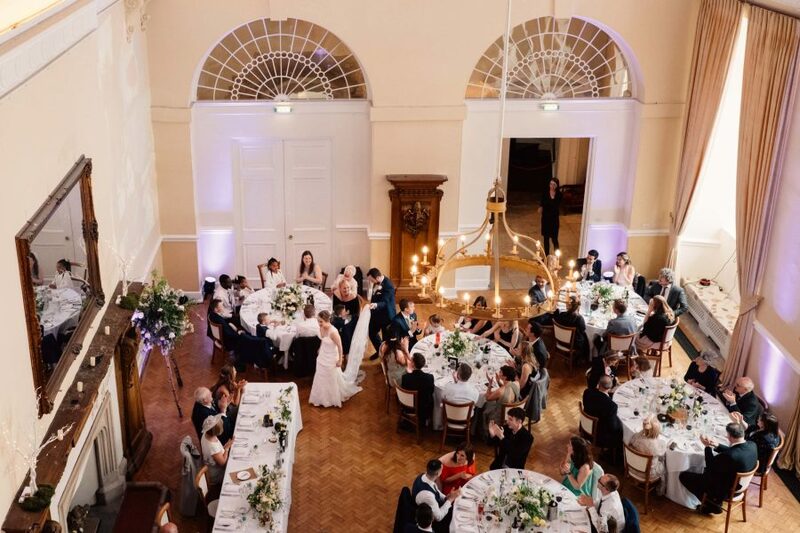 The wedding breakfast was held in The Great Hall which is such a light and airy space. 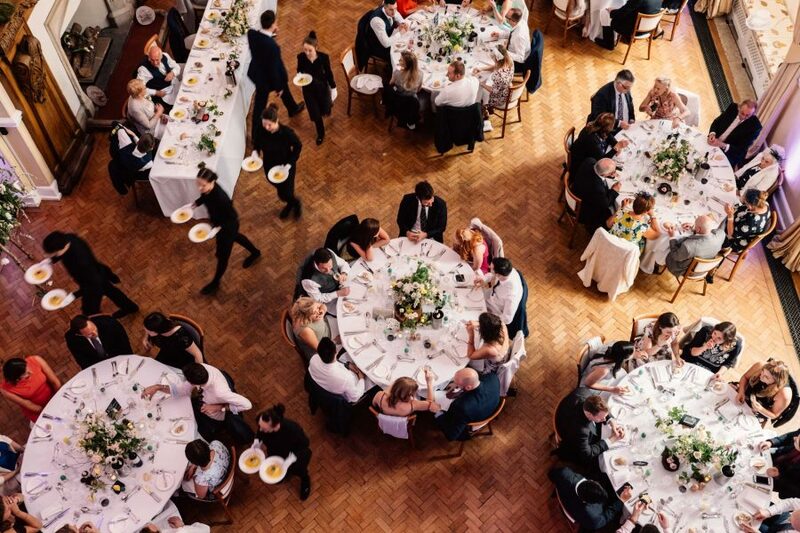 I took the opportunity to take a few aerial shots from the balcony during the wedding breakfast to capture the beautiful space before the wedding speeches. 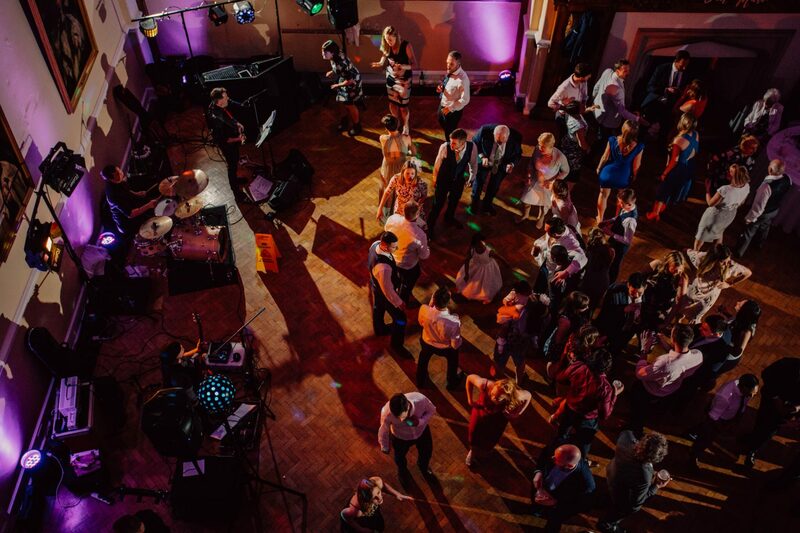 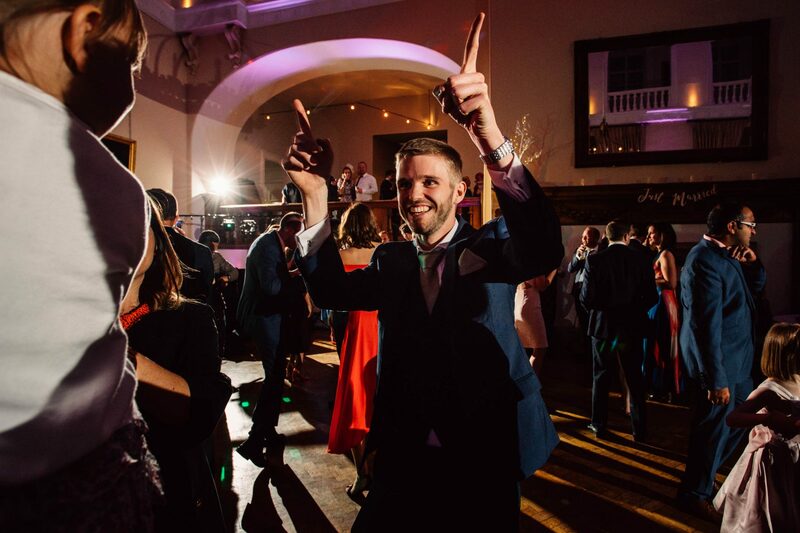 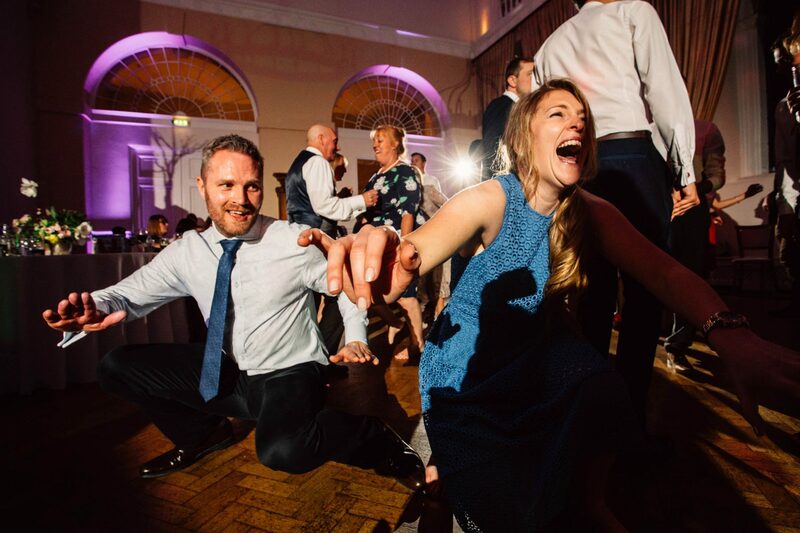 The Great Hall was transformed into a great dancing space for an awesome party that saw wedding guests dancing into the night. 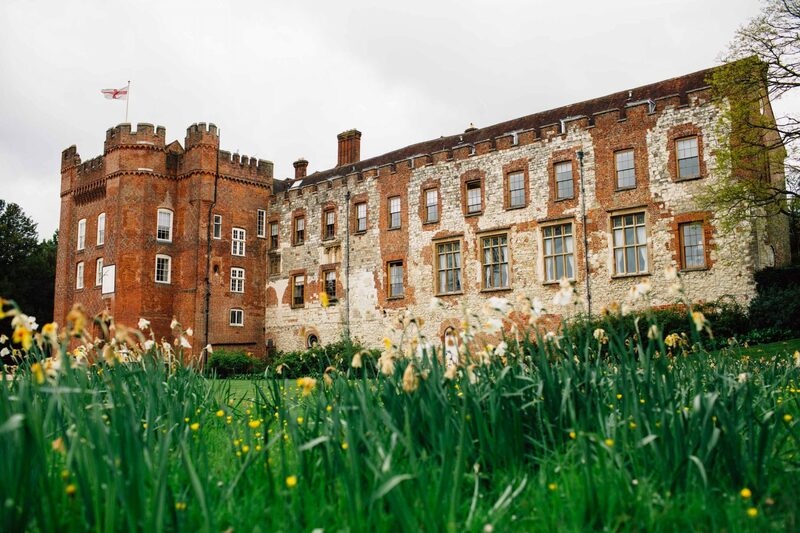 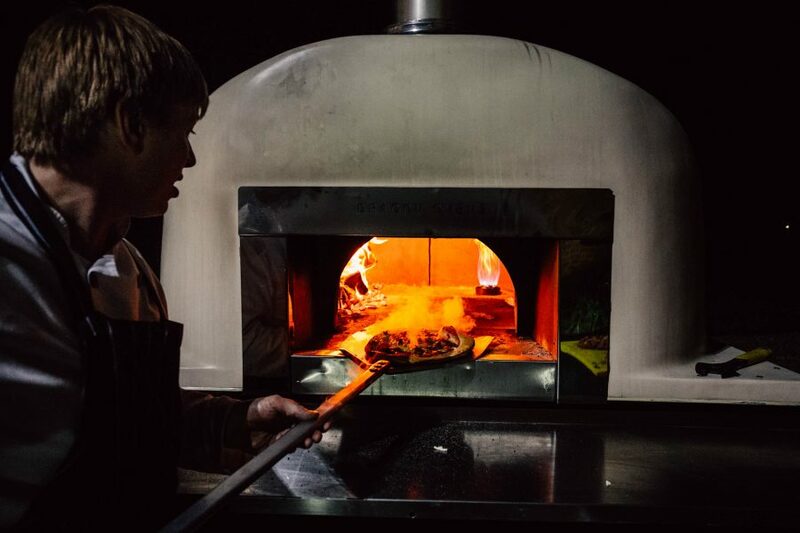 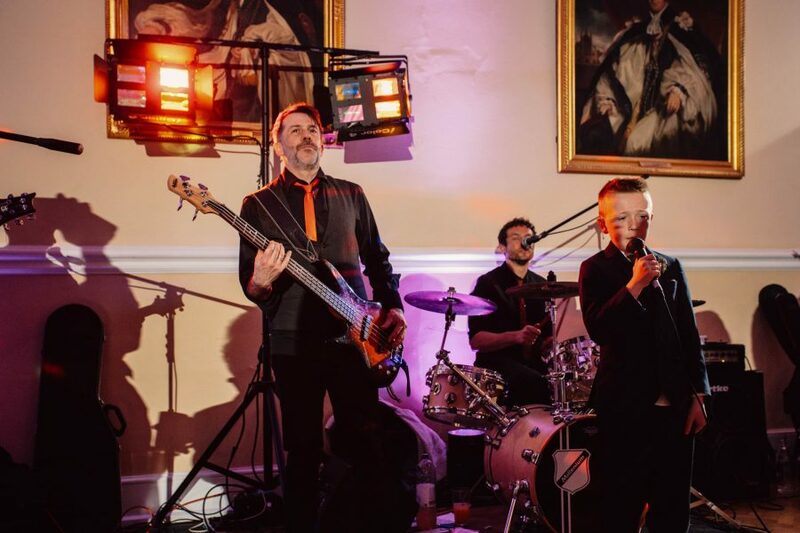 Thank you Louise and Scott and Farnham Castle – you rocked! 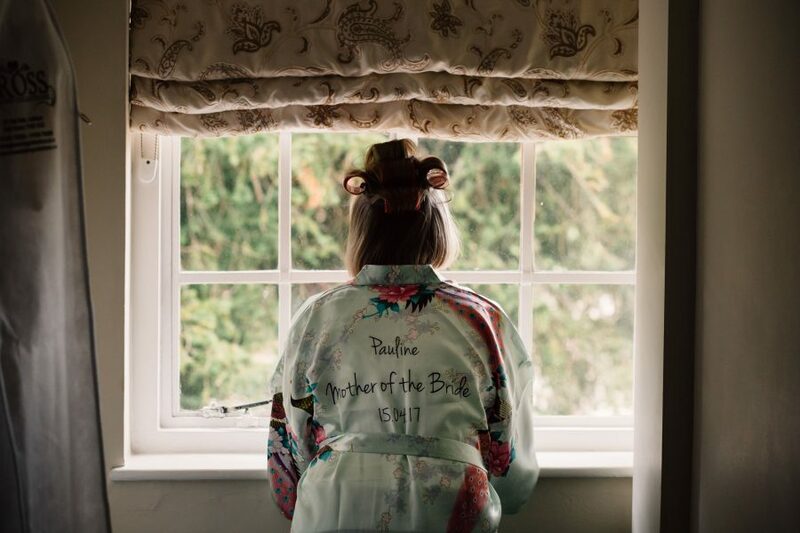 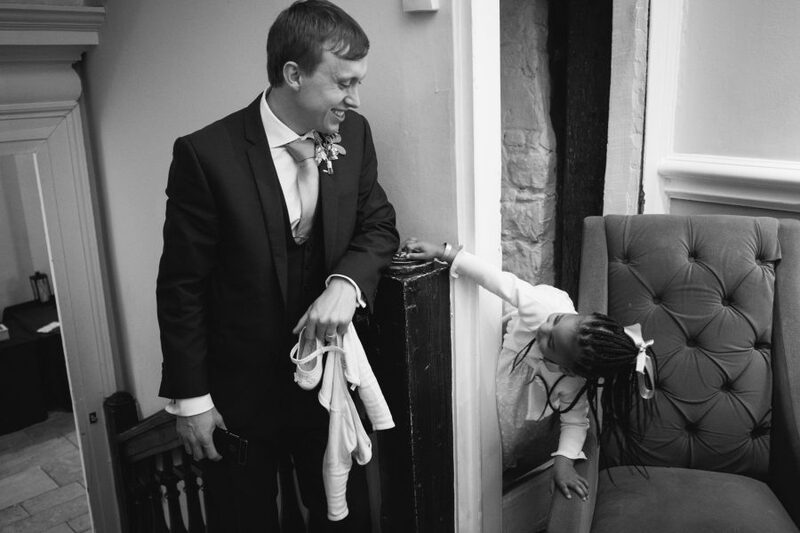 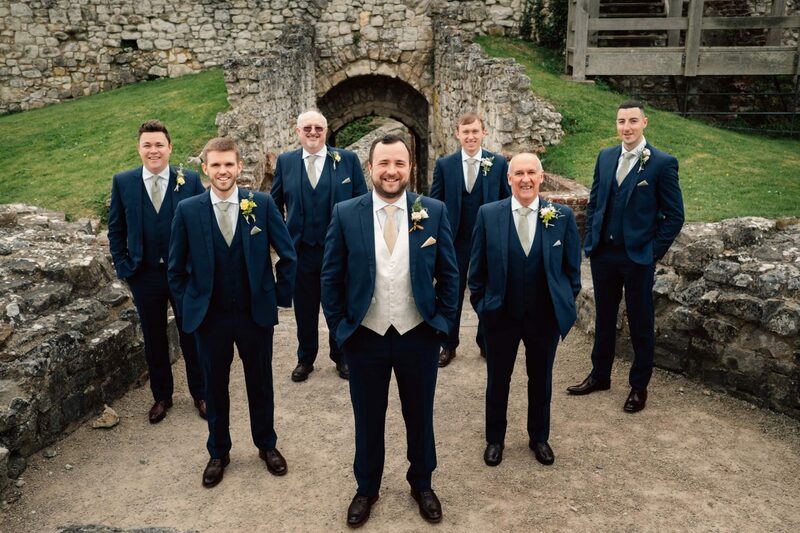 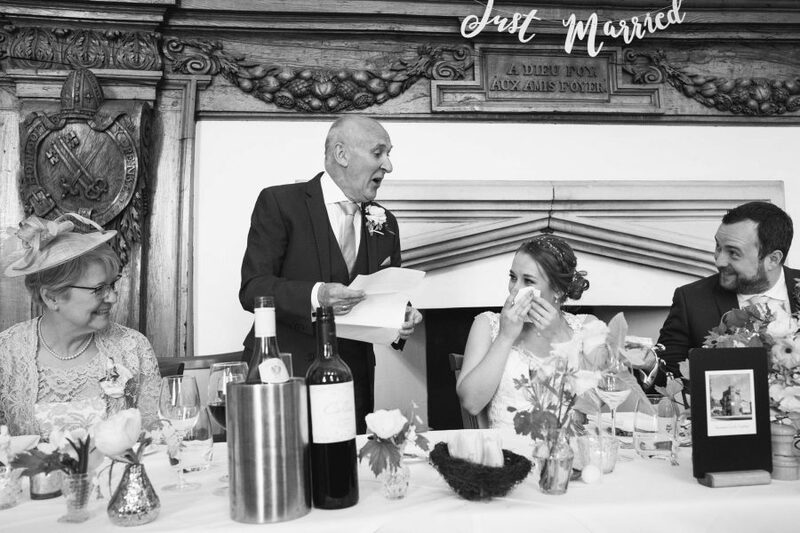 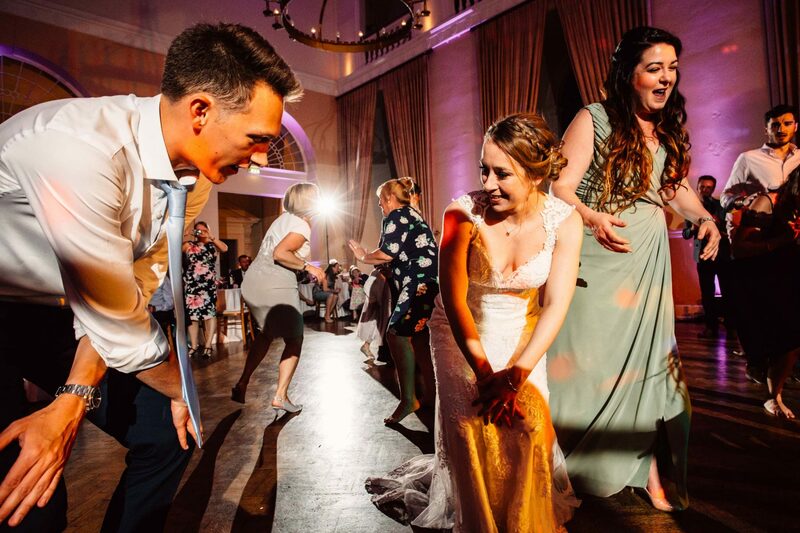 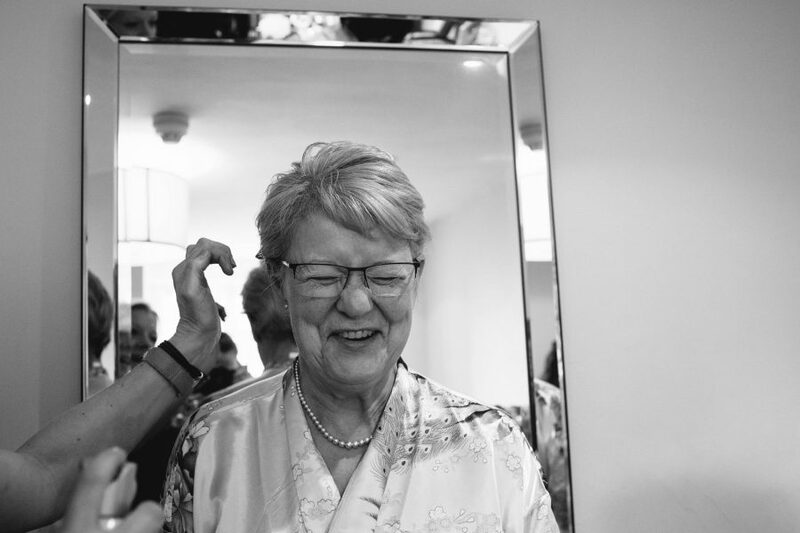 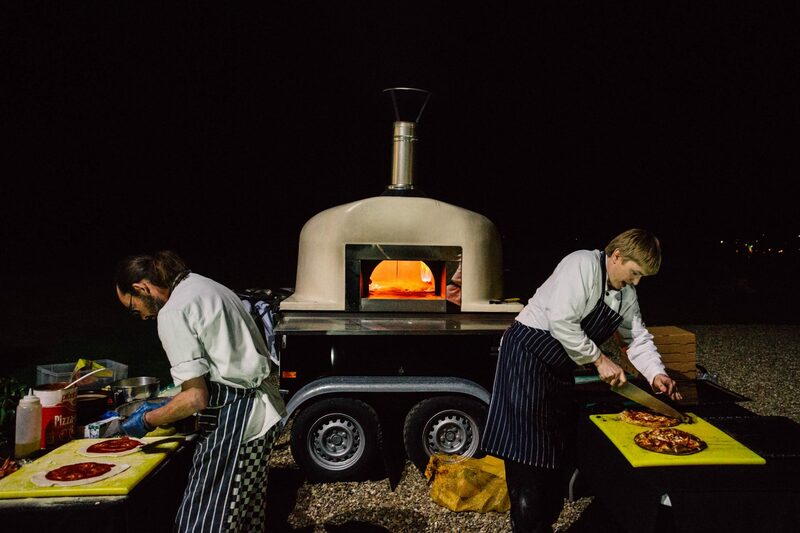 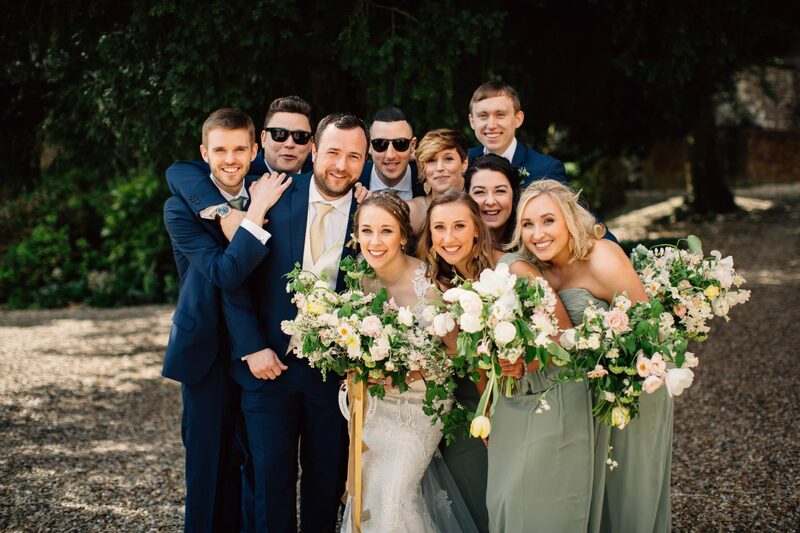 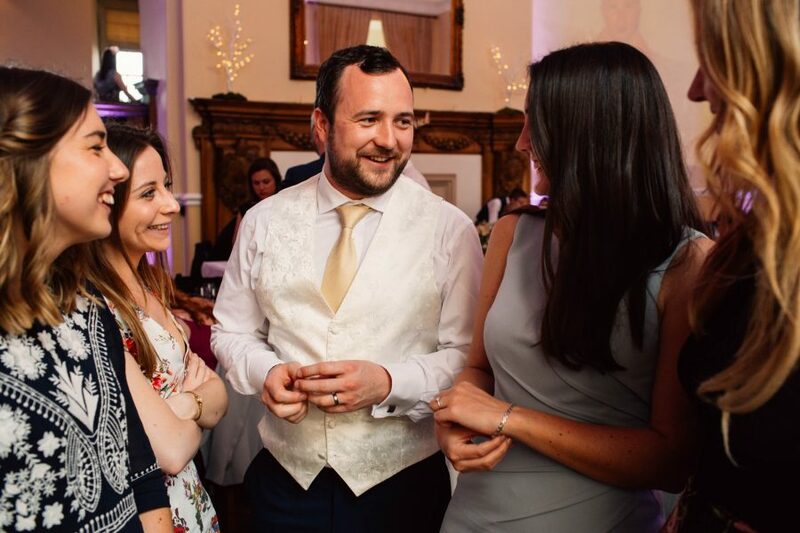 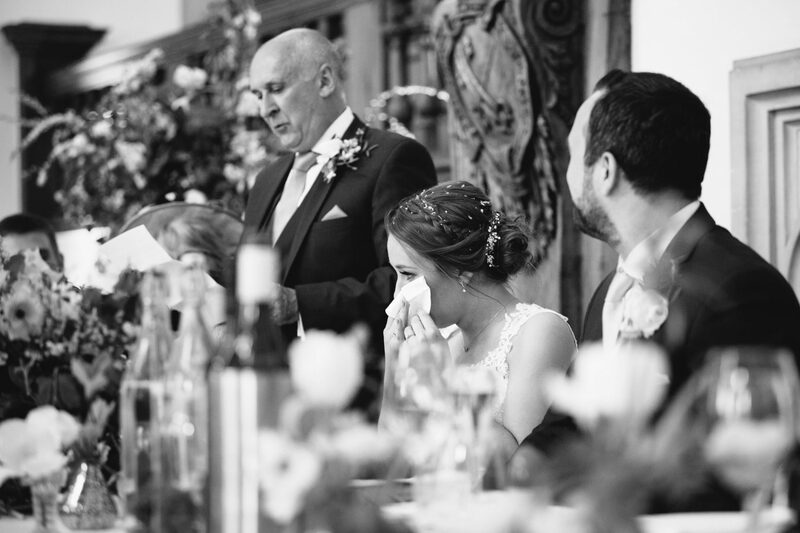 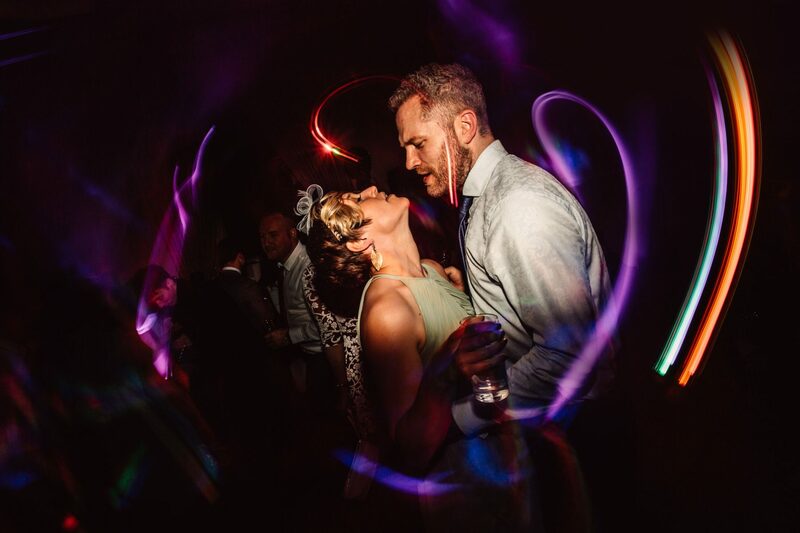 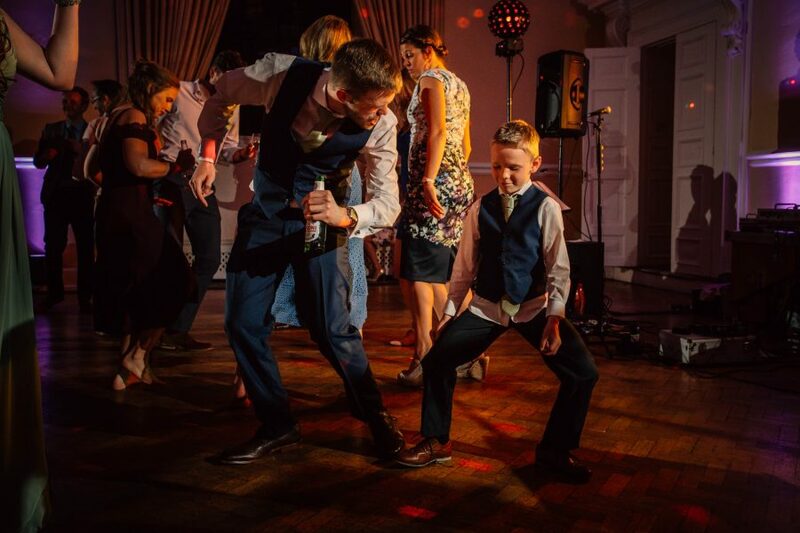 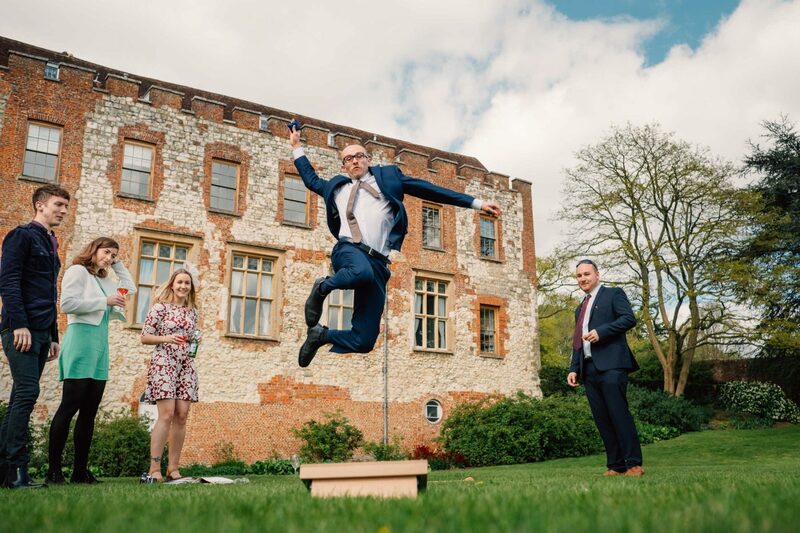 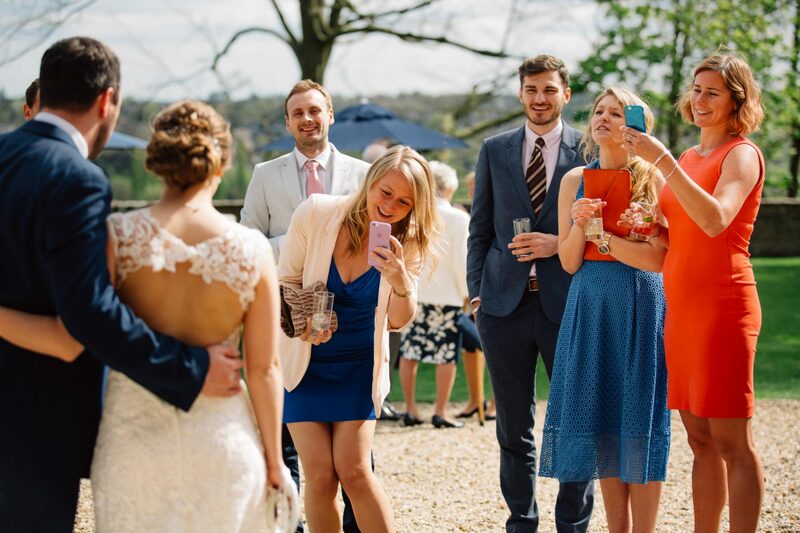 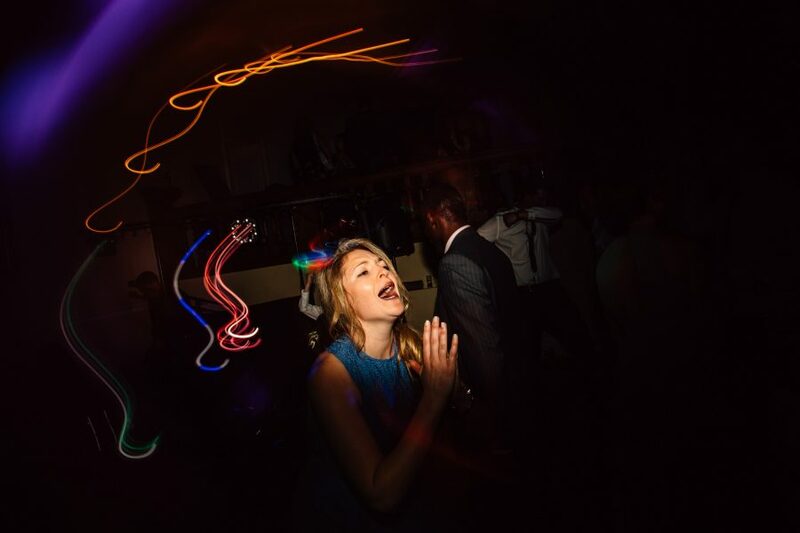 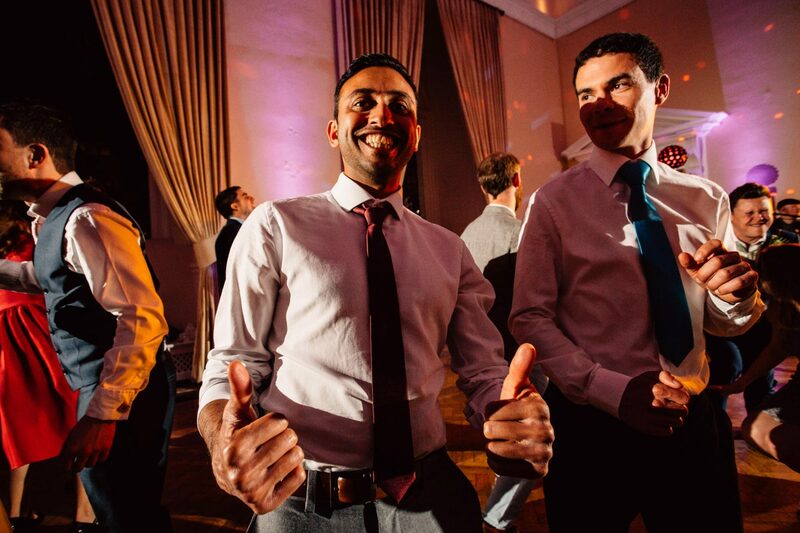 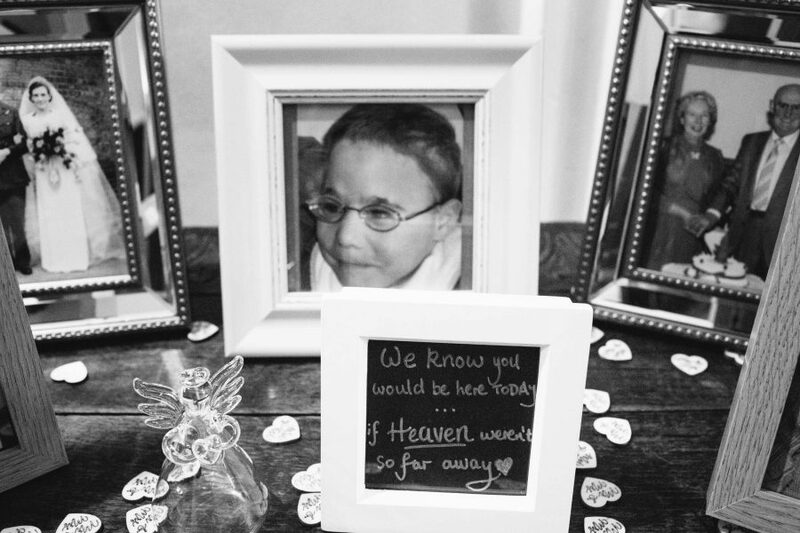 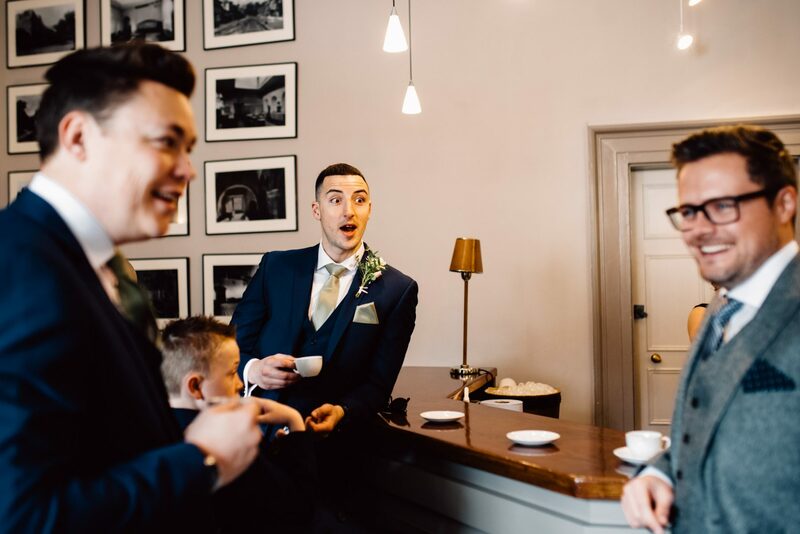 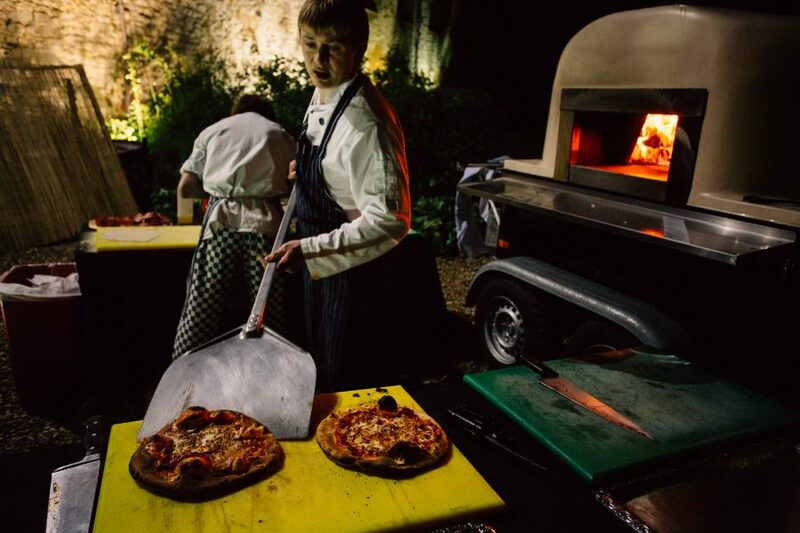 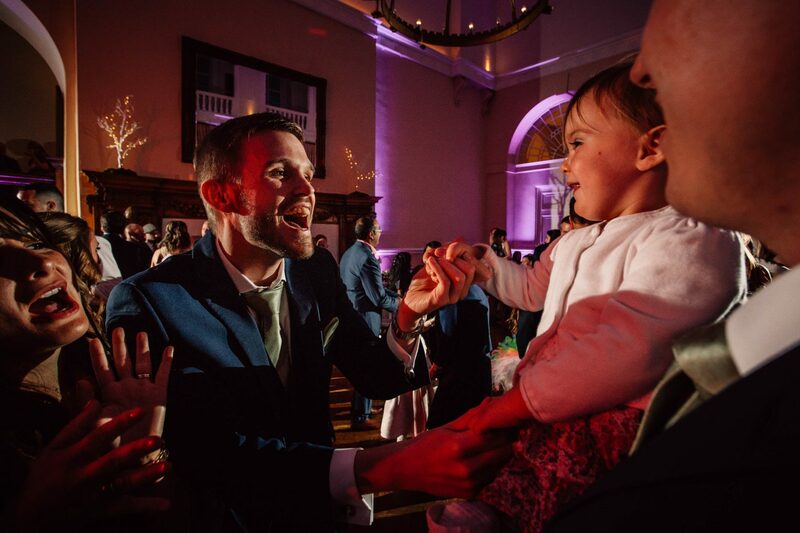 Scroll down to see some of my favourite pictures from this Farnham Castle wedding. 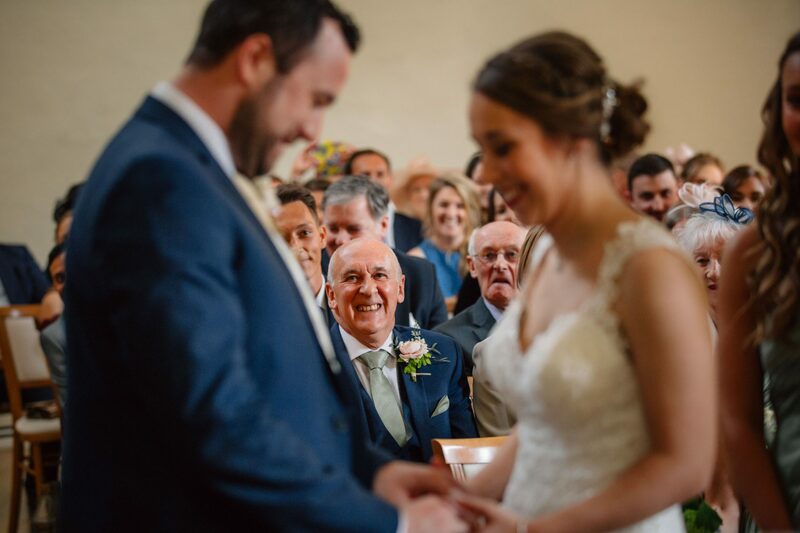 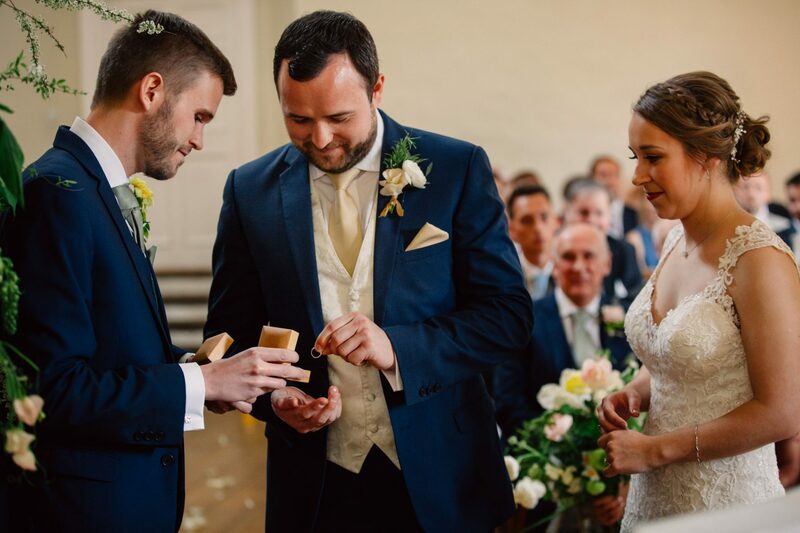 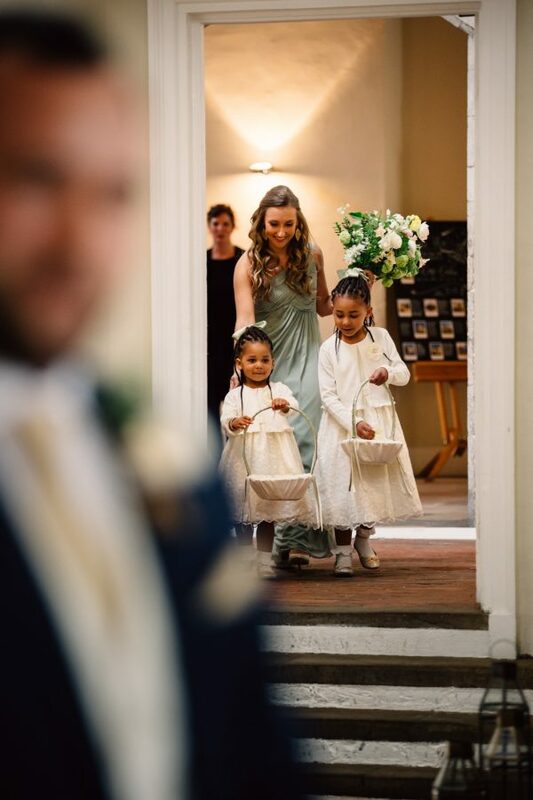 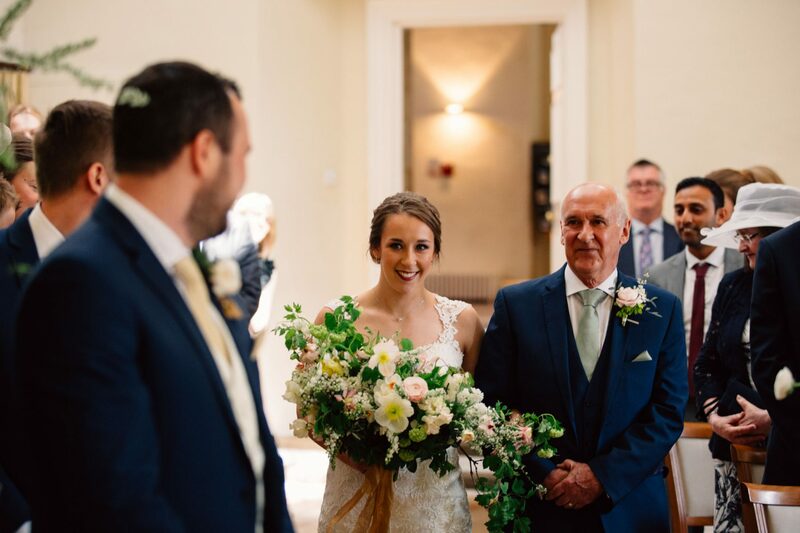 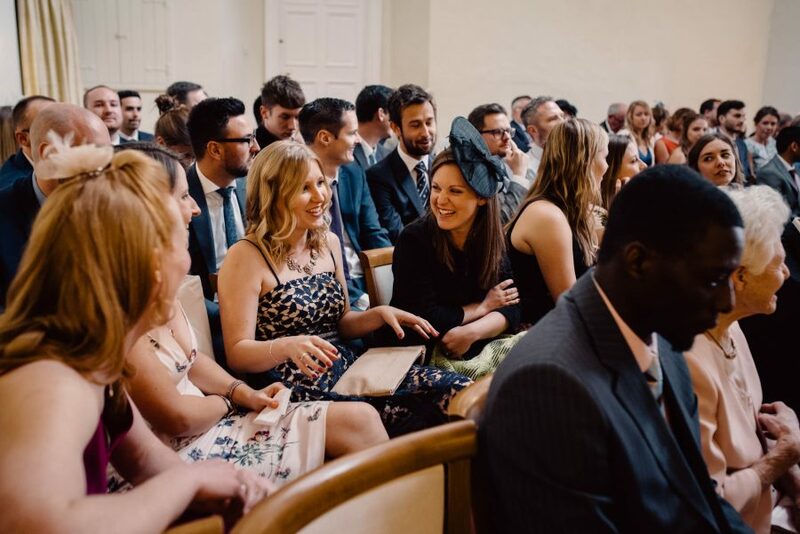 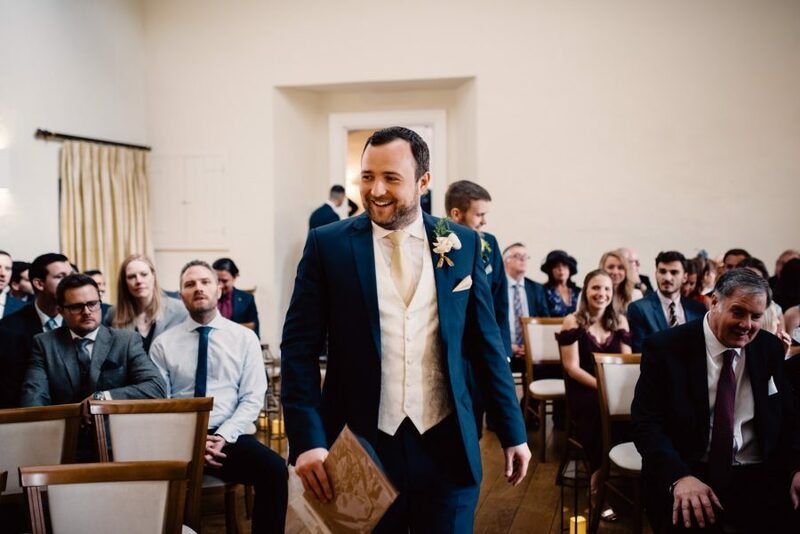 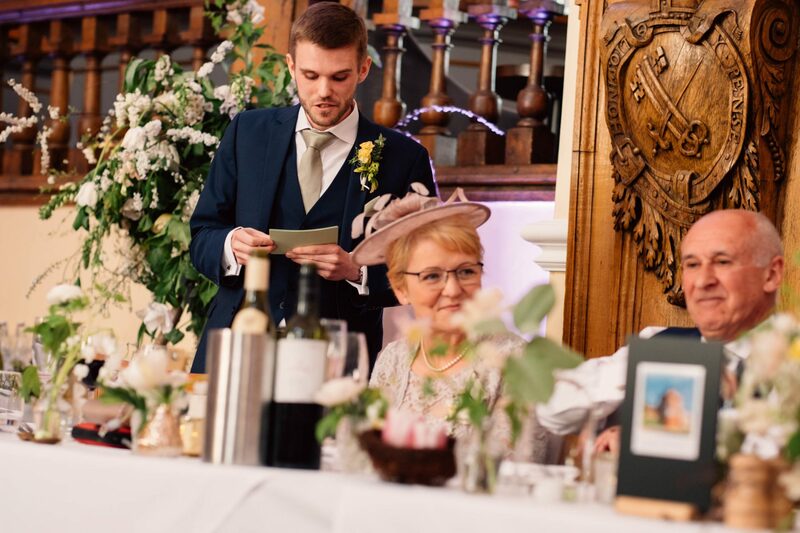 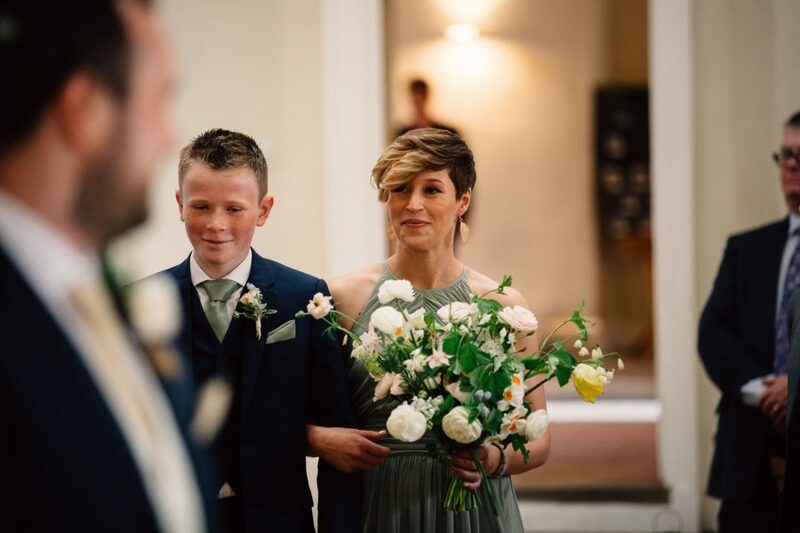 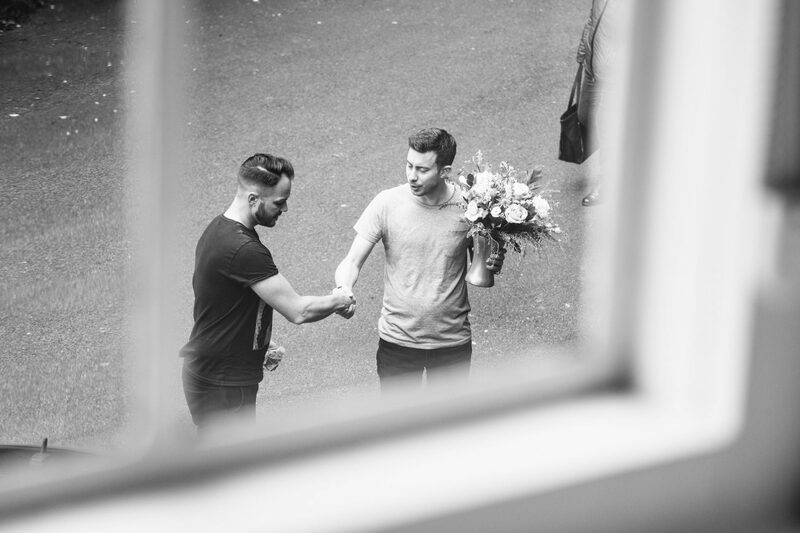 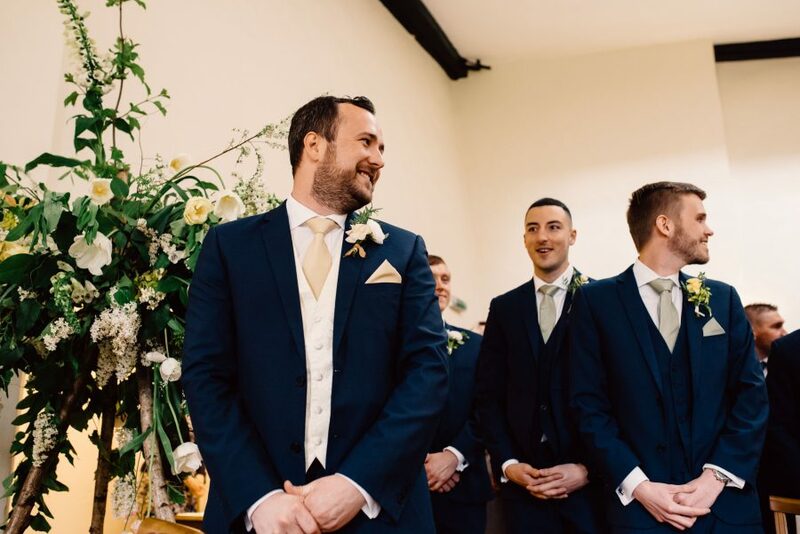 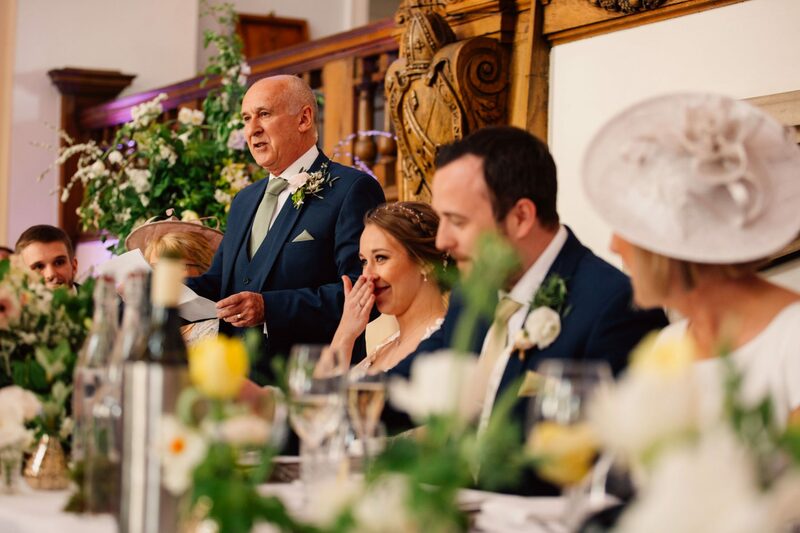 Then check out my full wedding of Lawrence and Georgie to see another Spring wedding. 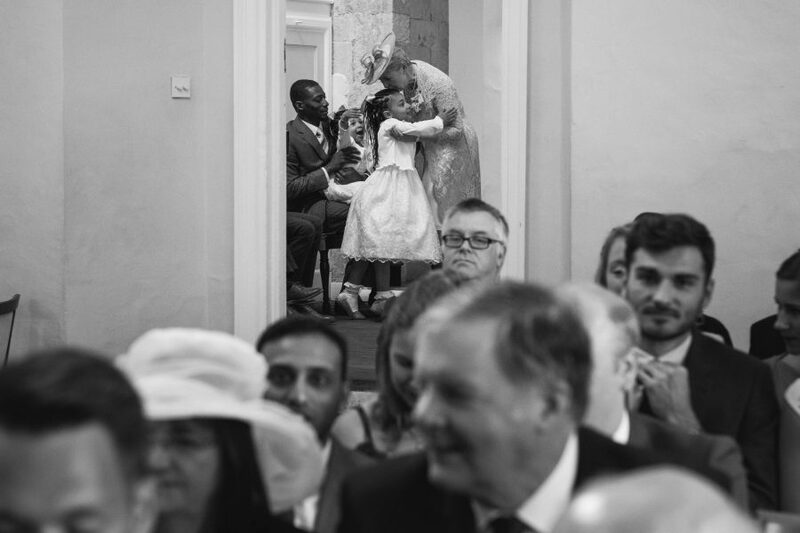 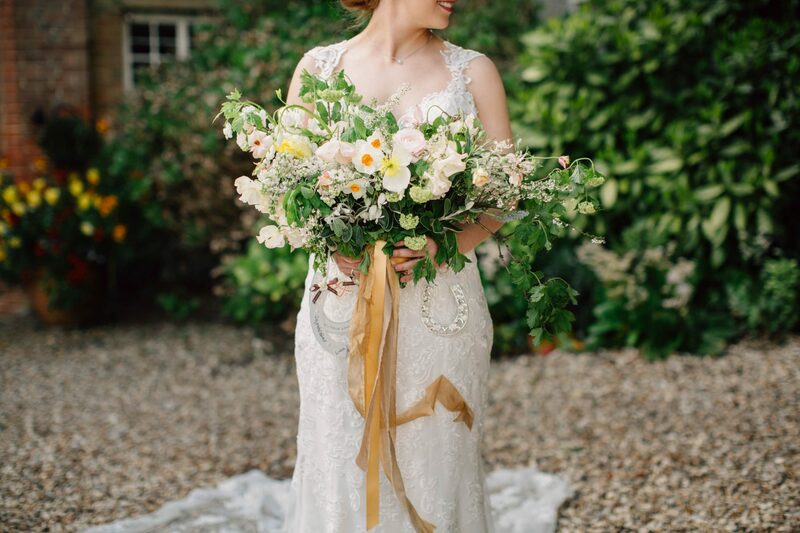 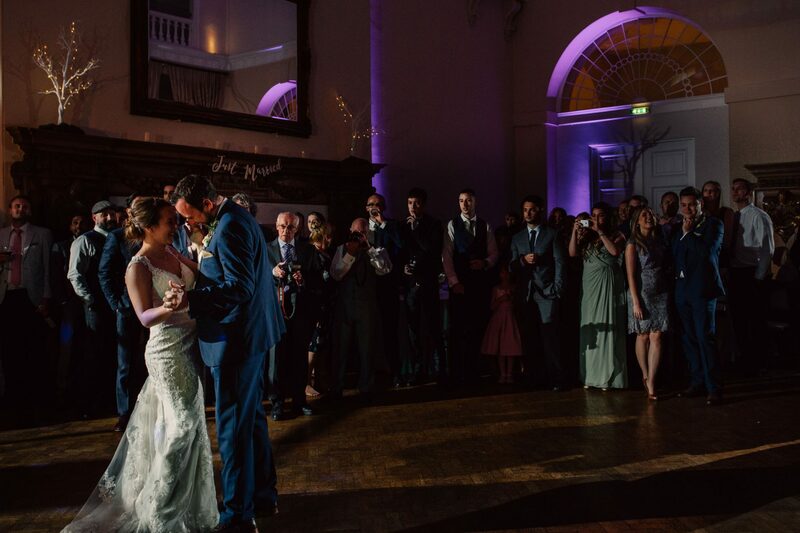 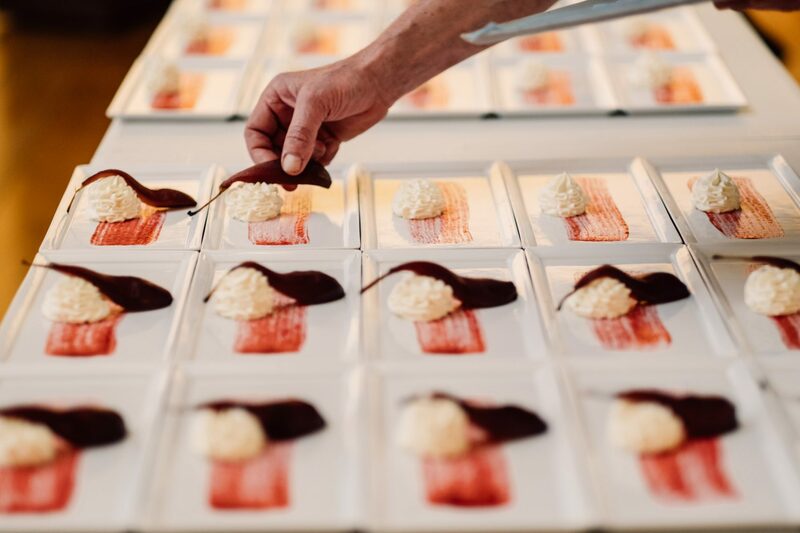 Or check out some lovely work as a Hedsor House wedding photographer. 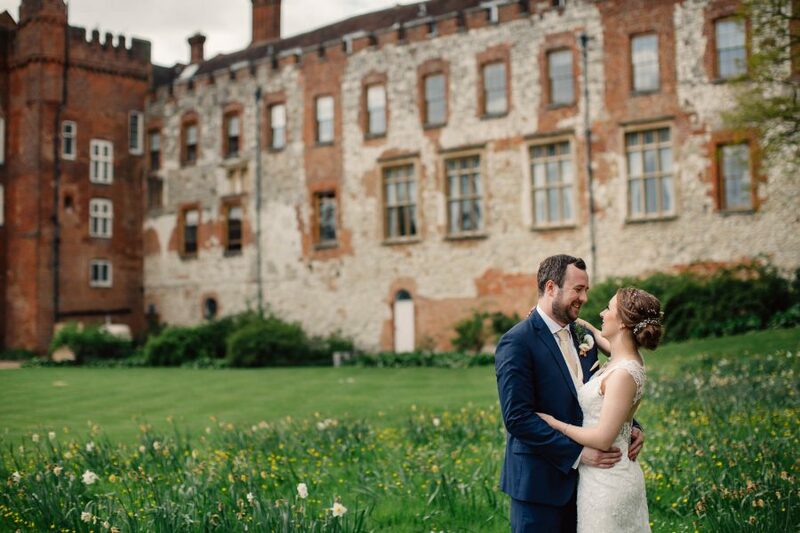 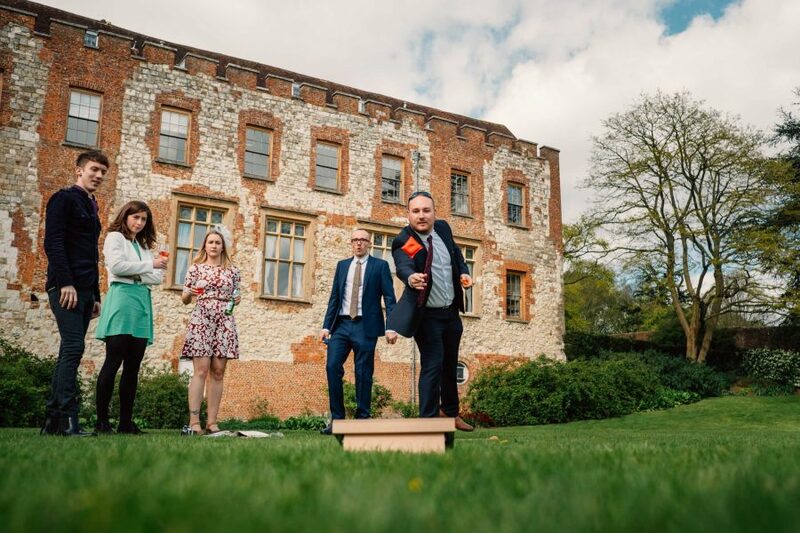 Love shooting at Farnham Castle! 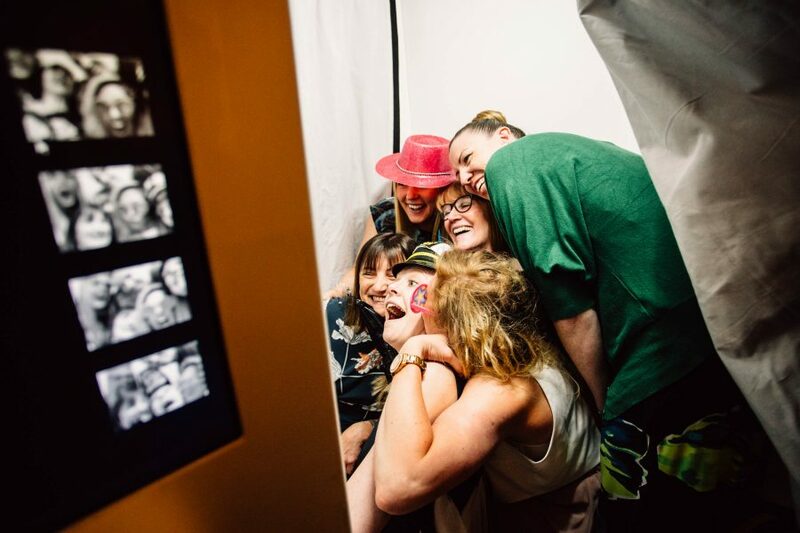 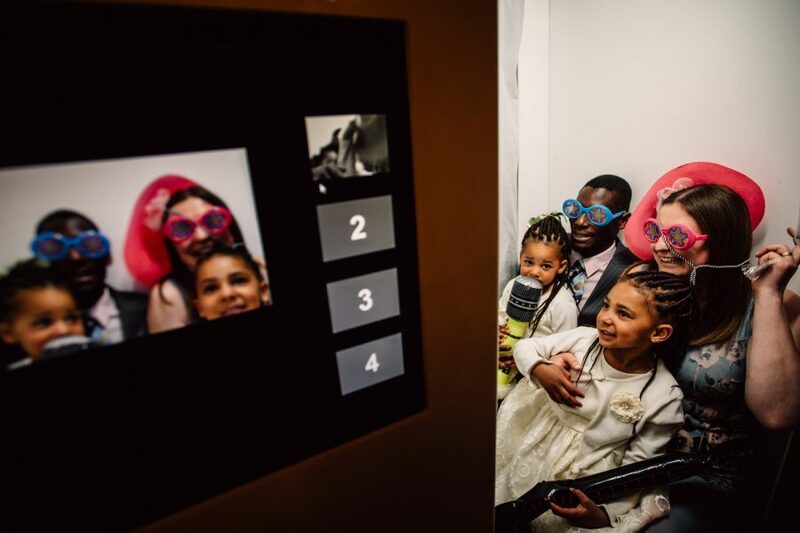 My favourite has to be the shot of the family in the photo booth.